Back in late Summer 2008, this was our first SP 9010 web page dedicated to accumulating and sifting through data on the many changes and modifications to the "Series" fleet. We've learned a lot since then, thanks to many folks around the world who've helped us shed light on the mysteries, as well as plenty of deep-digging of our own. SP 9010 has come a long way and there is still plenty of good information to be found here. But for the last word on what went where and when, please check our page called "SP's Modifications" first - refer to (or invest in) a copy of "Southern Pacific and the KM Hydraulics", the definitive work on SP's Krauss-Maffei locomotives to date - and then enjoy the following stroll through our discovery process. 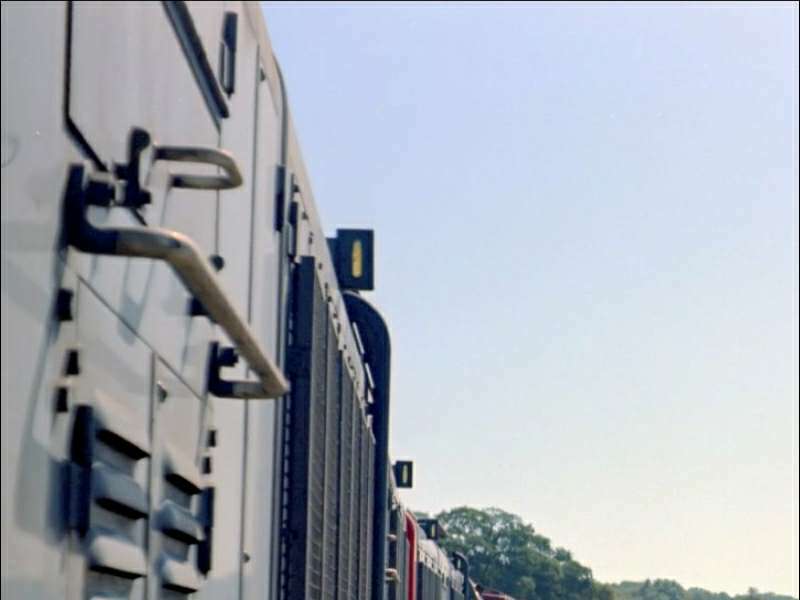 All locomotives undergo modifications during a normal service life. 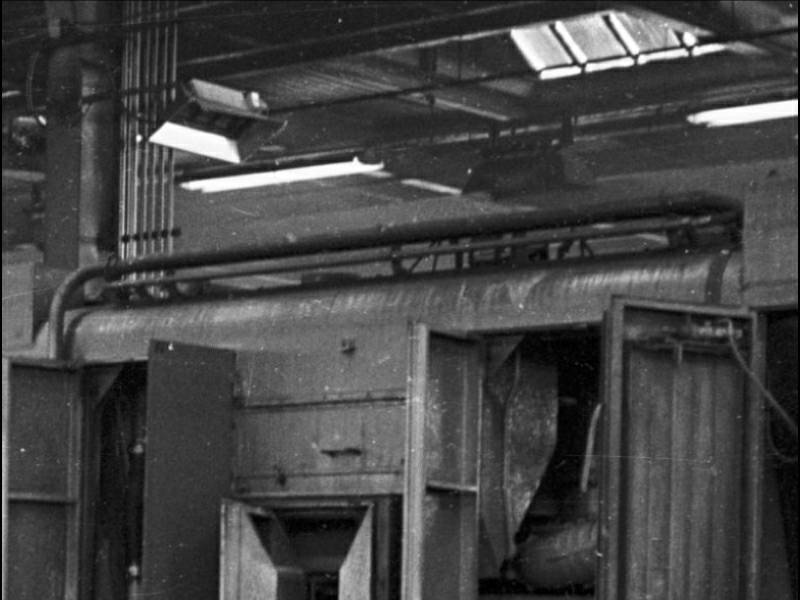 The Krauss-Maffei hood units saw their share of changes, over a lifetime cut far shorter than most. 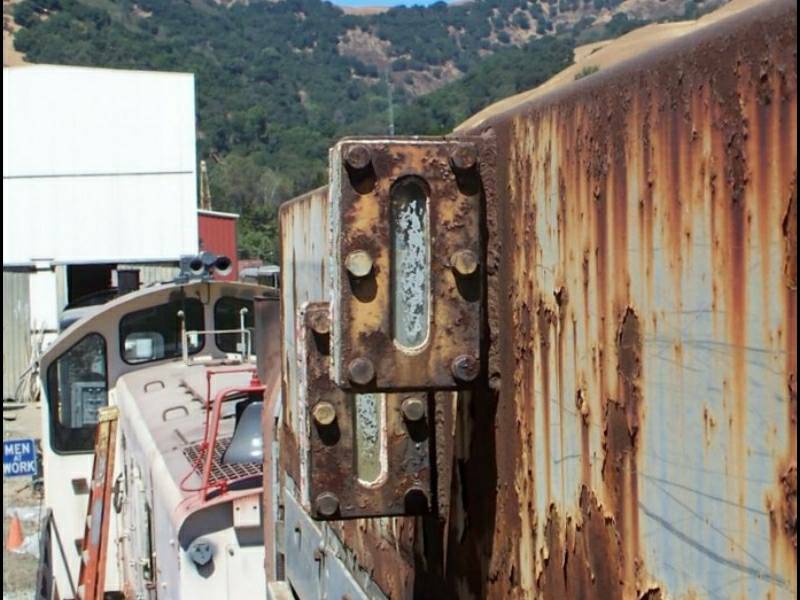 Those lives spanned barely four years from fresh enamel to scrap metal. 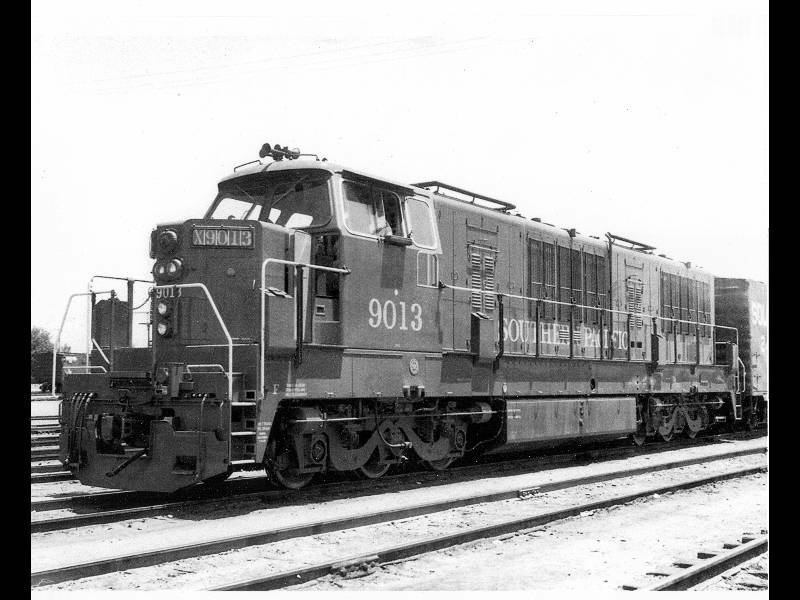 Perhaps because of the ongoing nature of the SP’s ‘experiment’ in hydraulic power, a single K-M may have experienced more changes in its short life than other SP locomotives might have endured in fifteen, twenty, or thirty years. Some were minor mechanical or electrical alterations; barely noticed without deliberate study, and meant to solve a minor operational or maintenance issue. Then again, highly visible changes like the beetle-browed sun visors, shortened cab windows, and those distinctive square-shouldered radiator header tank extensions served to substantially alter the face and ‘presence’ of the K-Ms. Whether for better or worse is still argued, four decades later. Class is still in session. Forty years after the last K-M turned a wheel under its own power, some of these changes are just now being discovered. 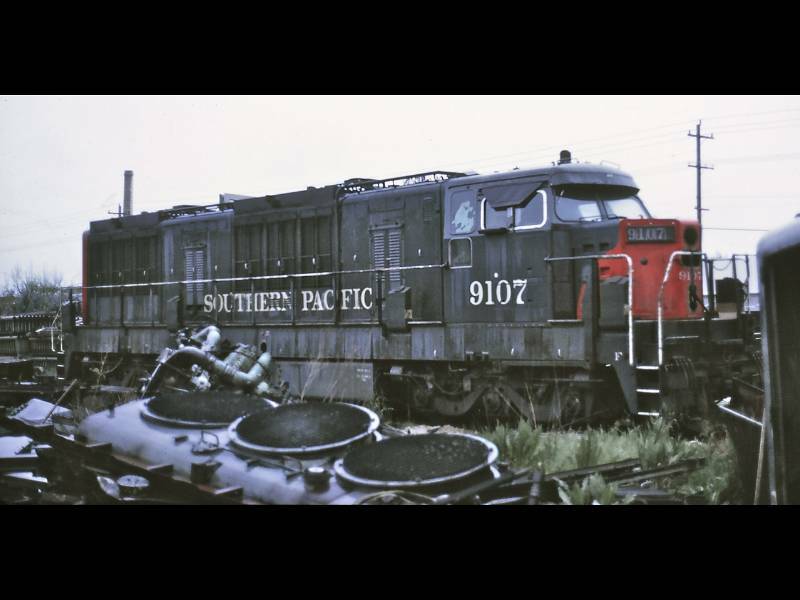 The PLA’s goal to accurately restore and display SP 9010 has inspired an exhaustive study of the photographic record of the fifteen hood units. Right now, that study is a work in progress. Photos of K-Ms are relatively scarce, and one suspects that many SP photographers treated the K-Ms as a curiosity, but not as a source of deep or ongoing study. It’s also difficult to trace the official records of these units, since the ‘experiment’ was generally regarded as less than a stunning success. 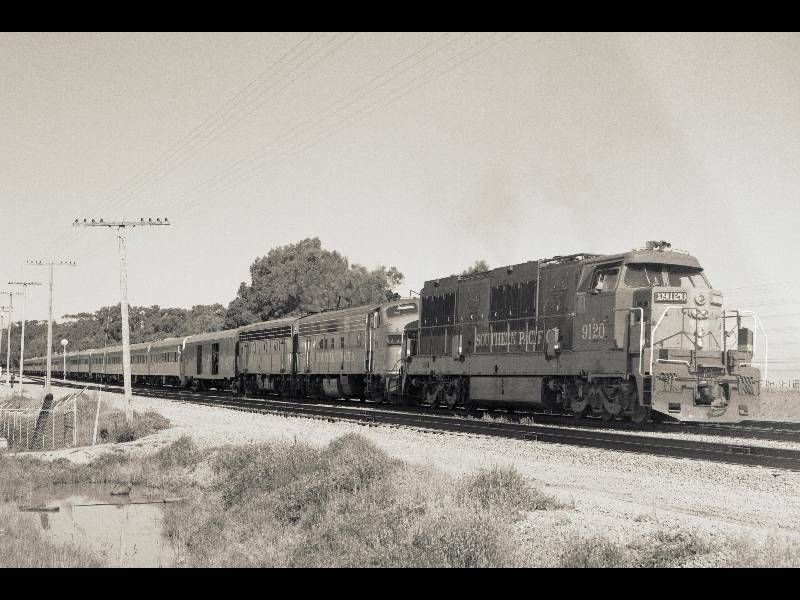 Crew memories are mixed, and the locomotives continue to draw lively, sometimes disparaging comment on both sides of the Atlantic. The SP disposed of most official documentation, and what remains is spotty. 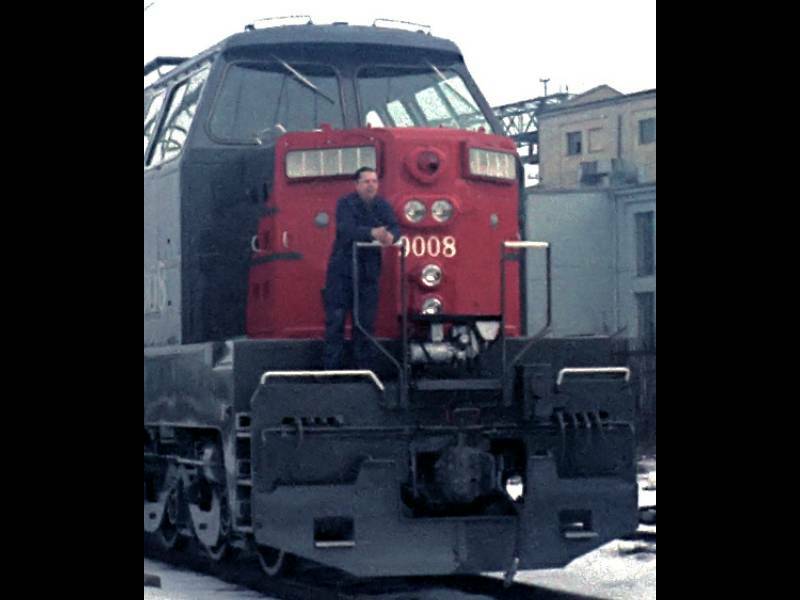 At this writing, the SP 9010 restoration team is working with former and current employees of several of the locomotive's suppliers and manufacturers and attempting to gather what documentation remains. Many files have been purged over the last forty or more years, and some suppliers do not maintain archives at all. As with many historical ventures, finding the records is a labor of love on a time-available basis. But it does appear that the "Ameriloks" still have many fans in Germany and elsewhere, and these interested individuals are donating time and effort to the project. Still, it appears that these locomotives were meant to be forgotten; a difficult assignment for something so unique, no matter where you stand on the love-hate issue. 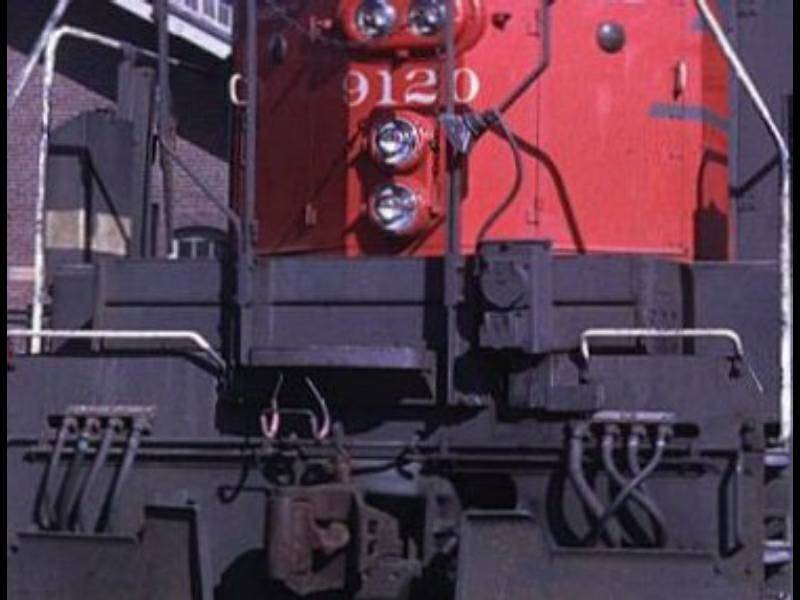 Meanwhile, it’s our hope that students of locomotive detail -- and industrial archaeologists of all stripes -- will enjoy the research that’s still in process on these fascinating oddballs. It may be the definition of ‘esoteric’, but this knowledge base continues to grow -- as new photographs, information, and personal recollections continue to surface. Change by change -- followed by a list. First, let’s look at the significant modifications individually. 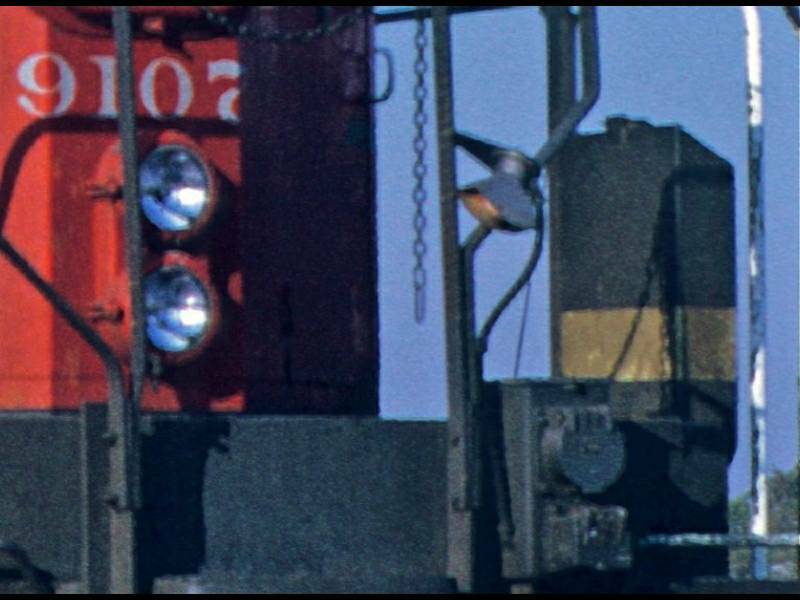 Not every ‘mod’ was applied to all fifteen hood units, but there were very few changes we can find that applied to one locomotive only. At the end of each discussion of a change, there’s a ‘MOD LIST’ of the units known (so far) to have had that particular addition or alteration. Most modifications, once made, were generally not unmade. Listed unit numbers generally reflect the first photographic evidence of that mod. If, say, unit 9004 received a modification under that number, we will presume it retained the mod when renumbered to 9107, unless specified otherwise. SP 9010, the last survivor, is a unique case… and will be described separately. 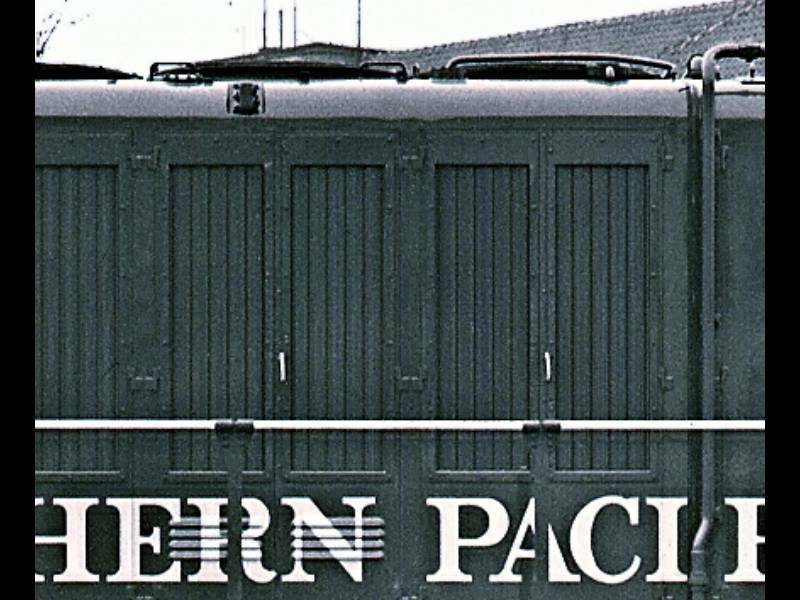 The six pioneering ‘carbody’ units were undergoing in-service modifications by SP even while the fifteen new hood units were being crafted in Munich. So it’s not surprising that some changes would have been made to the newbuilds on the erecting floor. 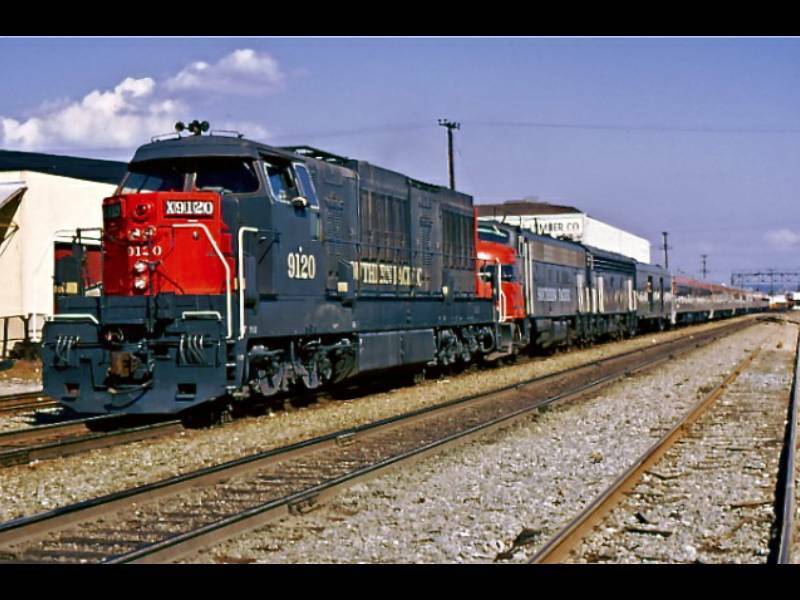 Other changes occurred almost immediately after the units were delivered and entered service. 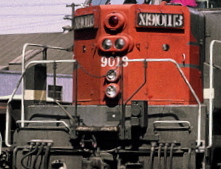 In 1964 it was still Southern Pacific practice to display train numbers in lighted indicator boxes – but the practice of having both ends of a locomotive so equipped was ending. 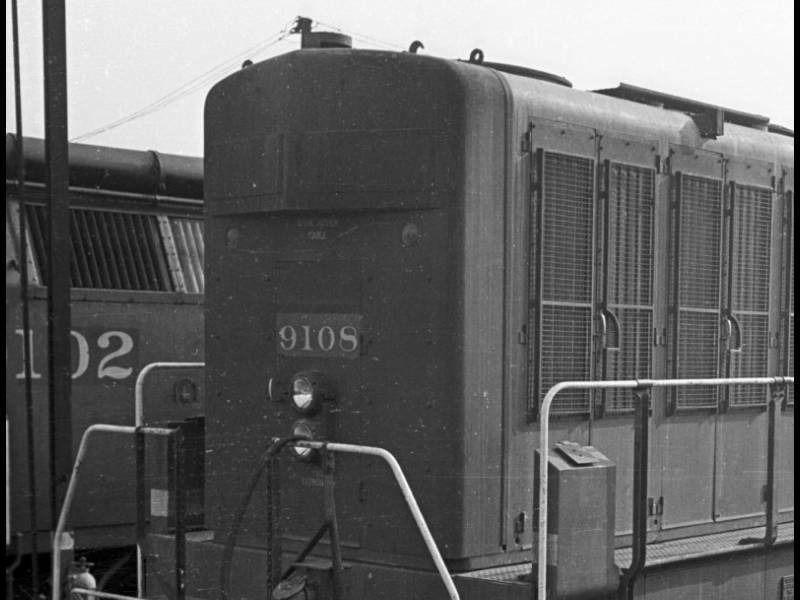 The first three units, SP 9003-9005 (later 9106-9108) had the upper rear hoods cut out for the installation of rear indicator boards, but these holes were blanked with a plate and fasteners while still on the line. 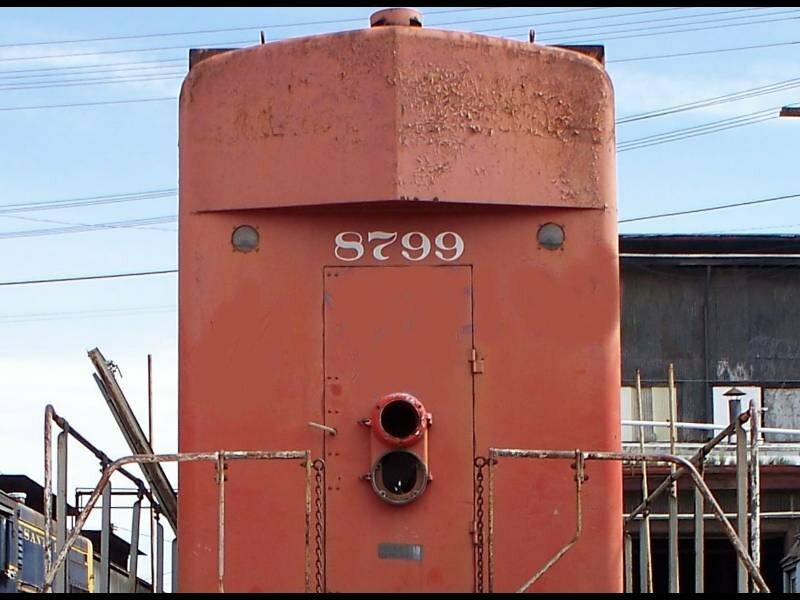 Recent photo evidence shows that 9007 was also fitted for rear boards, possibly 9009 as well. 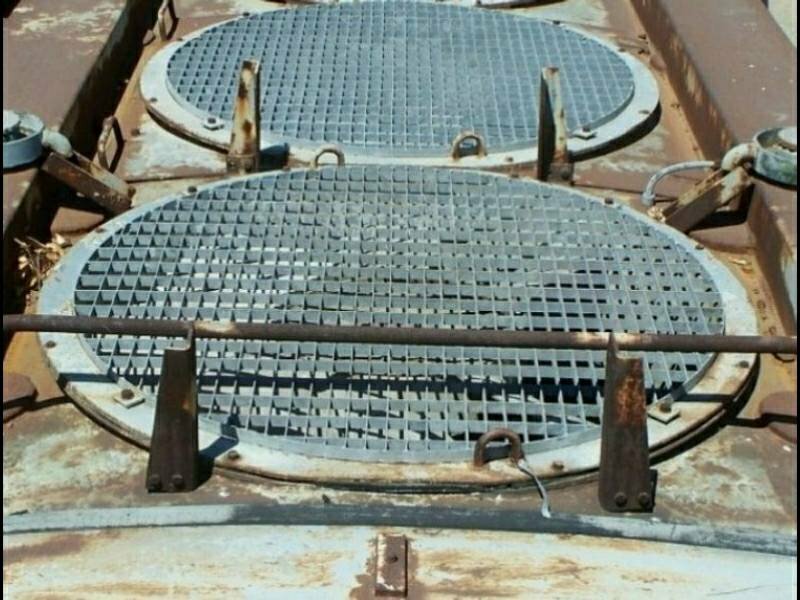 Bolt holes were also drilled for the grabs necessary for a crewman to ascend the ‘south face’ to change the indicator numbers, and were plugged with fasteners on these three units only. All subsequent units were featureless in this area. Looking at the carefully-crafted K-M number box, with its distinctive and flashy chromed over-center latches, a more interesting rear treatment was apparently very close to production before it was canceled. This early drawing (with full ladders) gives an idea of what was intended. Units with blanked rear number boards and ladder grabs from new: 9003, 9004, 9005. SP 9010 sports the ‘smooth look’ from the factory. A study of K-M factory photos reveals that something noteworthy is missing. 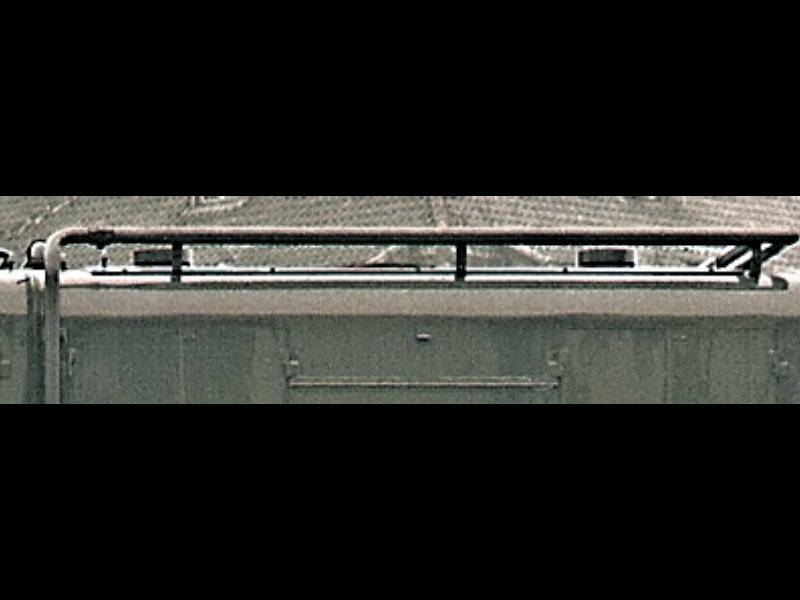 In all photos of K-Ms in SP service after delivery, there is an obvious overhang to the walkways, complete with prominent shadows – an overhang that’s mysteriously missing from almost all K-M factory shots. Below the outer lip, the walkway tread extension pieces are fastened to angle bars. 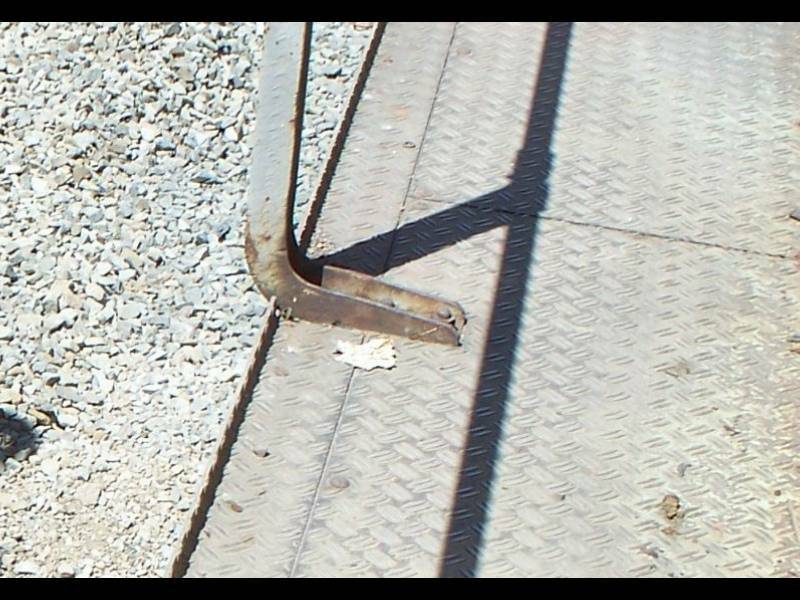 Additionally, certain handrail stanchions are bolted to spacer brackets, and additional fabricated brackets lock the whole works together. Our initial theory was that SP may have visited the production line and requested wider walkways than K-K had originally designed. But further study has revealed this to most likely be a clever solution to a clearance issue -- a consideration for shipment from the factory in Allach to the docks at Bremen. 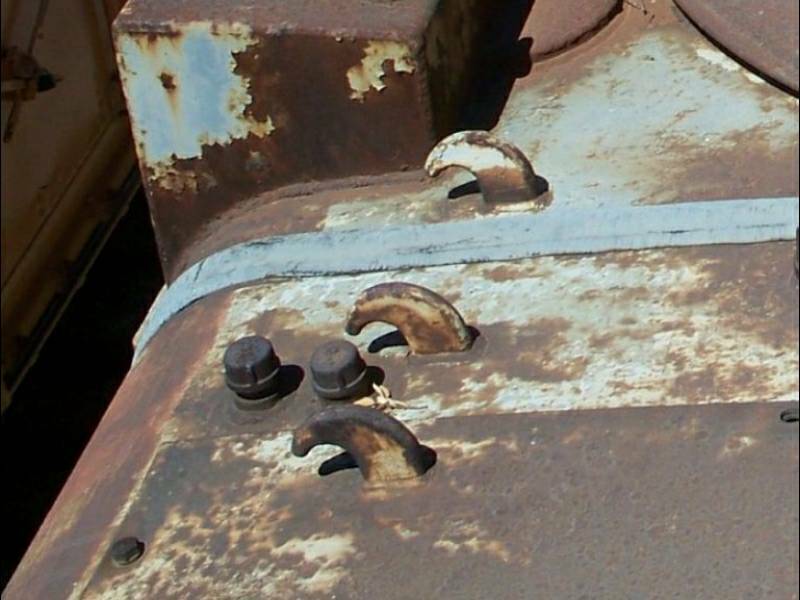 German loading gauge clearances had a maximum width of about 10 feet, but the AAR clearance plates (under which the locomotives would operate for the SP) were broader. 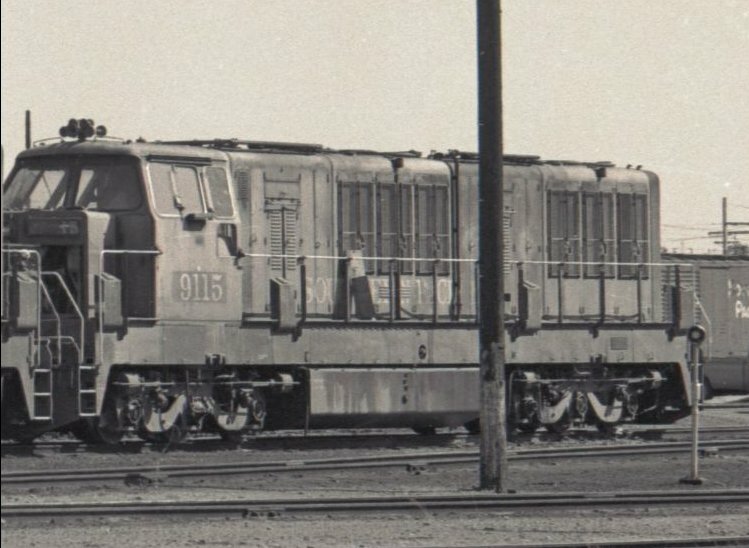 It appears that K-M built the cab and frame dimensions out to the maximum German dimension of 3000mm, but devised removable walkway and handrail stanchion extensions to be applied later when safely delivered to the USA. The sandboxes were also unbolted and the holes covered for transit, since the boxes extended considerably past the frame edge. 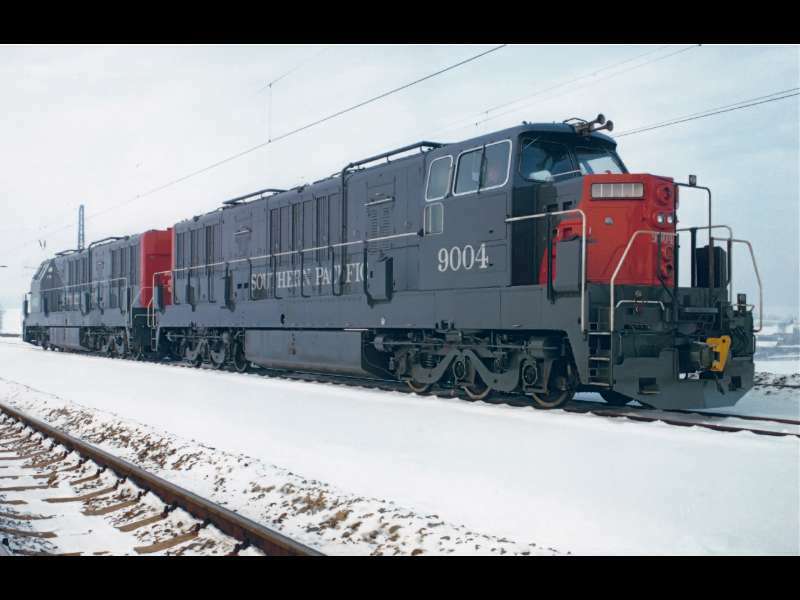 Overall, K-M was able to reduce the width of the locomotive for transit by nearly six inches on each side. 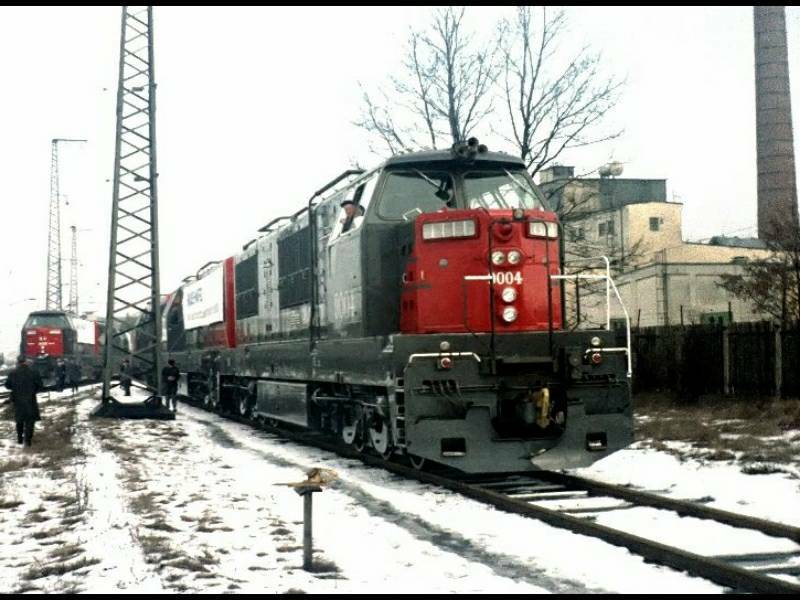 Or put it another way, K-M found an innovative means to exploit SP's more generous American clearance restrictions once the units reached their new home rails. Either way, a fascinating detail -- and one which only has revealed itself through recently uncovered photographic records. SP 9010 features the additional ‘widening’ strips on the long hood walkways. 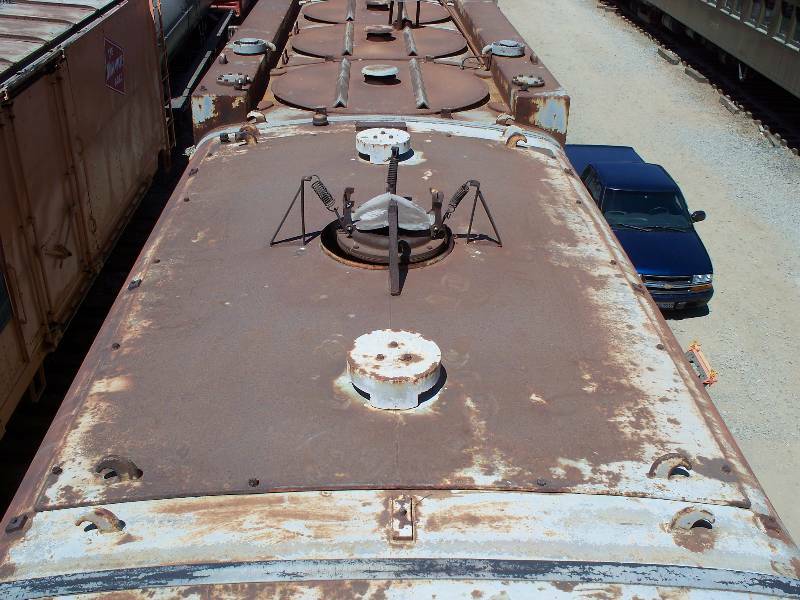 Looking at images of the two radiator hood sections shows another detail not present on the factory subjects. 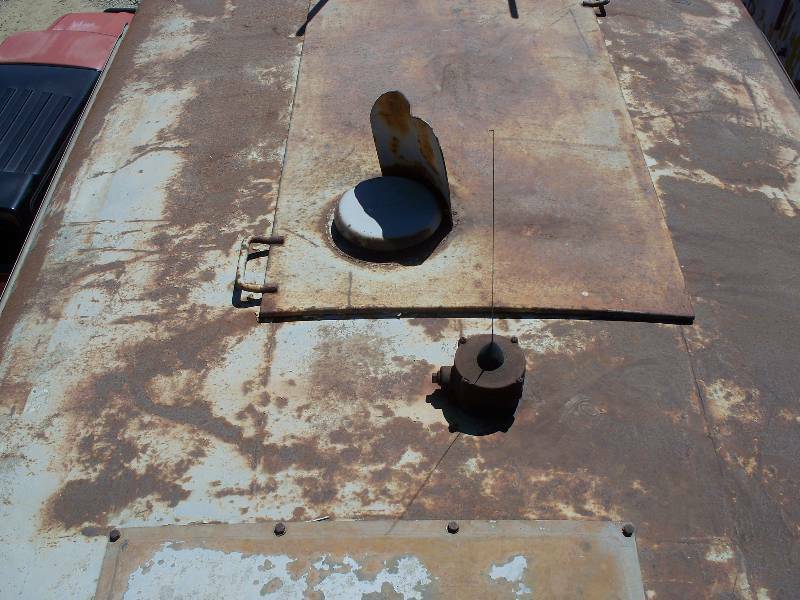 Located adjacent to the middle fans, just above the ‘shoulder’ of the hood sections and just above the header tank sight glass, is what appears to be a narrow platform with a lip similar to the widened walkway material. 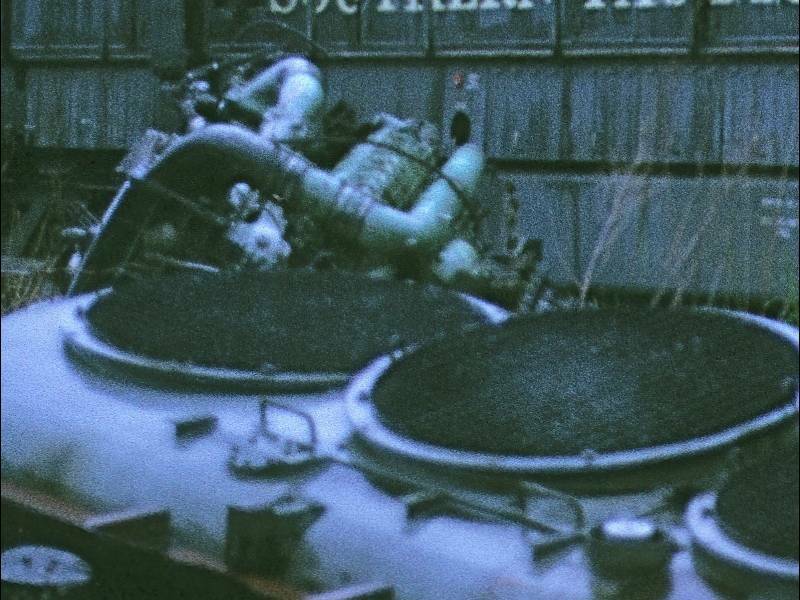 In the salvage yard photo of SP 9107, a cast off radiator section lying on the ground reveals what appear to be support brackets in this location, and what seem to be two hand grabs on the center fan’s ‘hatch’. The center fan tilts up from this side, giving access to the ‘valley’ between the radiator banks. These platforms appear only on the engineer’s side of the units, facing the direction in which the center fan tilts open. It’s likely these platforms were suggested to give a crewman a safer footing while performing this operation. 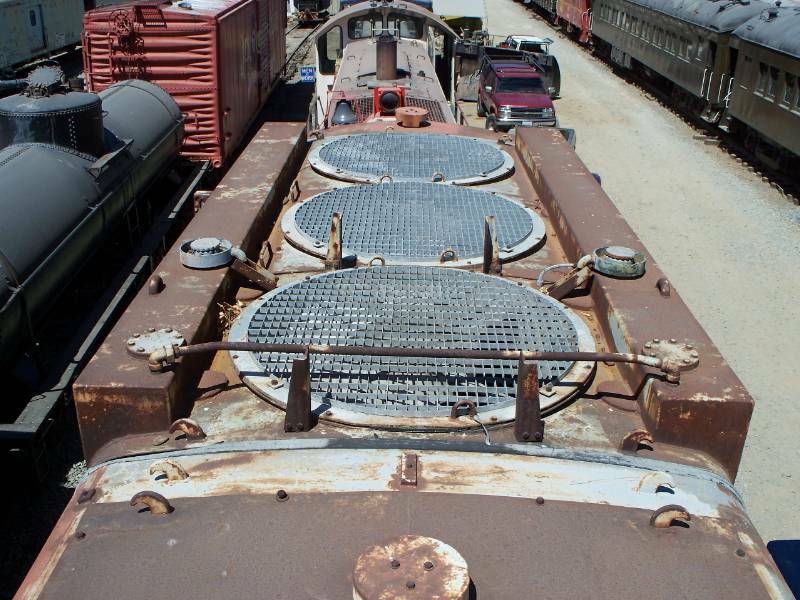 SP 9010 had these ‘platforms’ removed when the radiator header tanks were enlarged and squared off. EARLY CHANGES – IN THE FIELD. 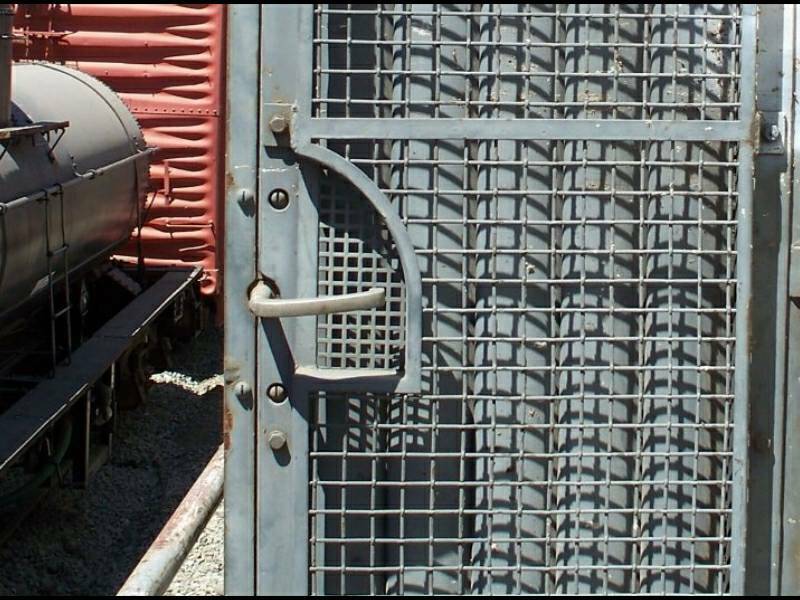 One production change we took for granted is the installation of safety screens over the air-actuated radiator shutters found on each radiator compartment door. K-M builder's photos don't show them, and photos taken during 'test drives' at or near the K-M plant don't either. 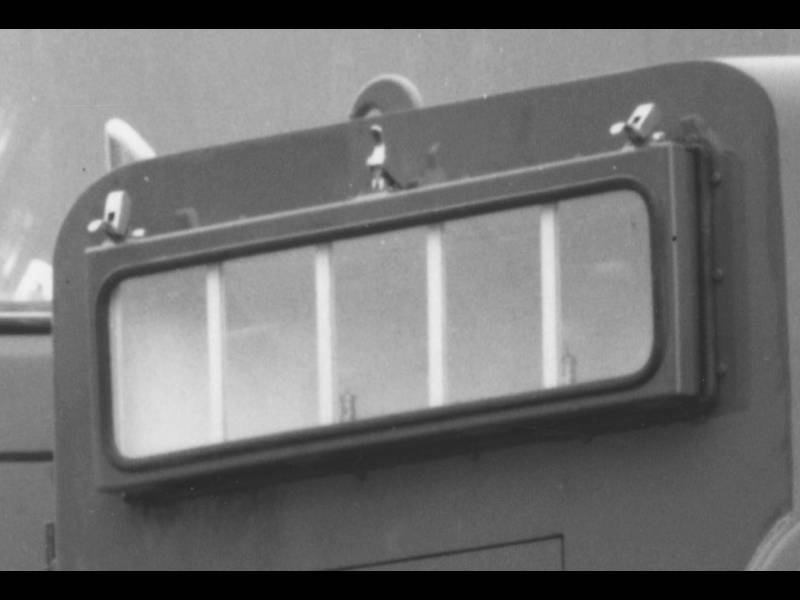 But all locomotives were shipped with these screens in place. So we're including them as an Early Field Mod. Note the two different types of screening; one a large-grid wire-cloth style, and the smaller area by the door latch handle as perforated metal. 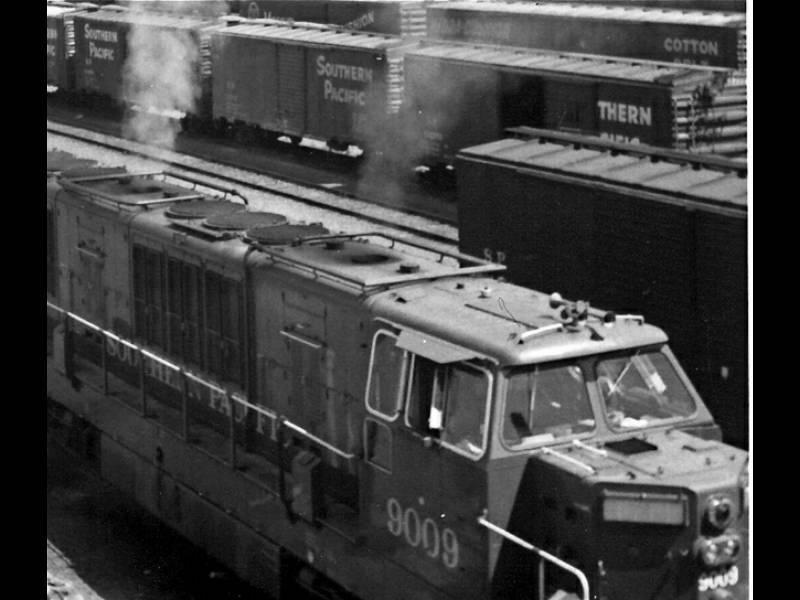 After only weeks or months in service, photographic evidence shows that all fifteen hood units had their multiple unit jumper boxes raised by almost the height of the box itself. This was accomplished by adding a vertical electrical conduit to the existing horizontal one, and adding a support bracket to the original box, thus bringing its bottom level with the upper surface of the platform. The raised box included raising the ‘kink’ in the left-hand stanchion brace, presumably for crew clearance and access. SP specified that the K-M’s be able to operate with any other M.U. equipped SP locomotive. 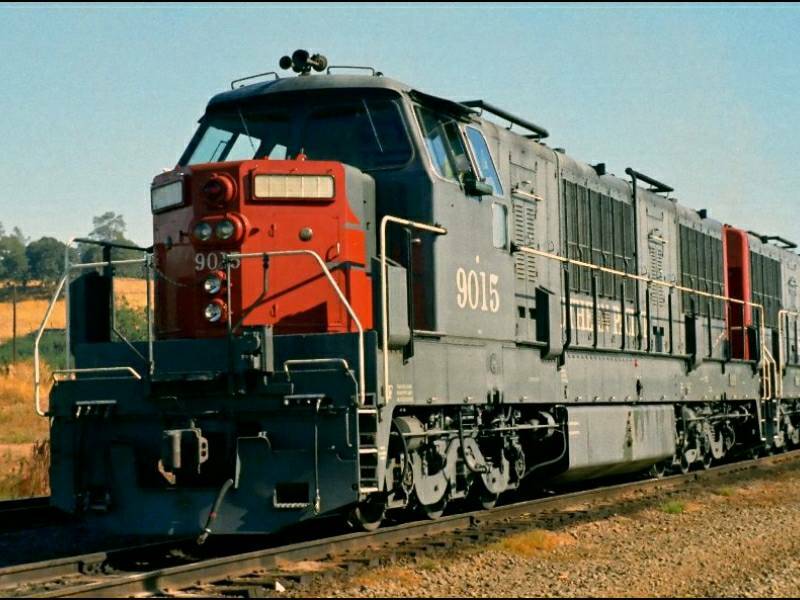 Common lashups included the ubiquitous EMD F-series carbody units. The jumpers for the standard 27-pin M.U. connectors (round lid) were usually more than long enough for the job. 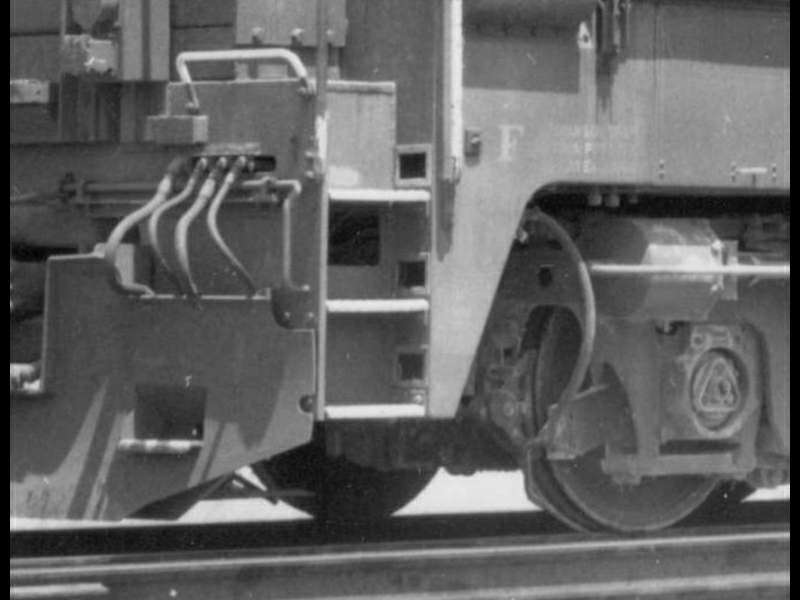 But the dynamic brakes of early EMD's required a heavy current three-wire "field loop" connection (rectangular lid). 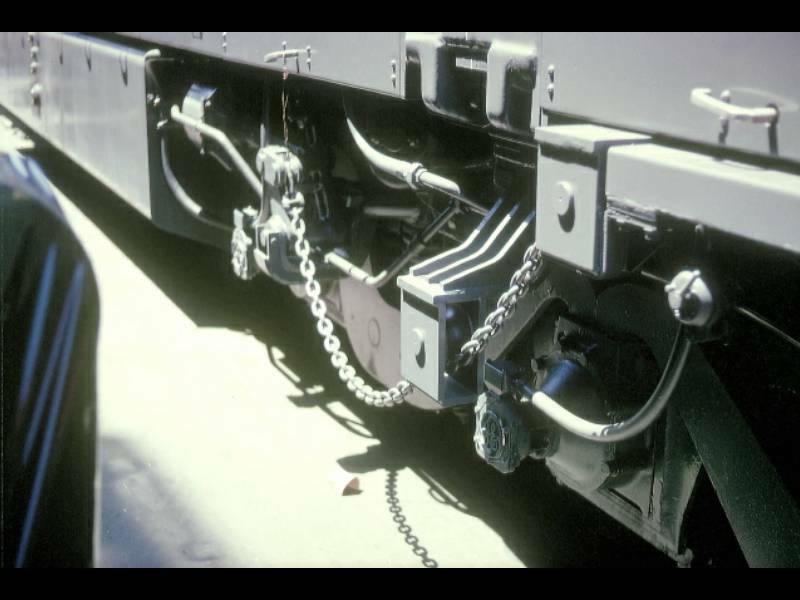 By 1964 when the K-M's were conceived, MU control of trailing unit dynamic brakes was being handled by one wire of the 27-pin connector, a so-called "point potential" signal. But as long as older units were being used in multiple with newer, the newer units to also carry the field loop capability. Those connections were made with large-gauge jumper cables similar in structure to an auto battery jumper, but with three wires. And crews recalled these cables as being shorter than the average 27-pin cable. 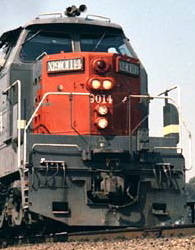 With F-units still very much in the locomotive pool, lashups between K-Ms and F-units were common. 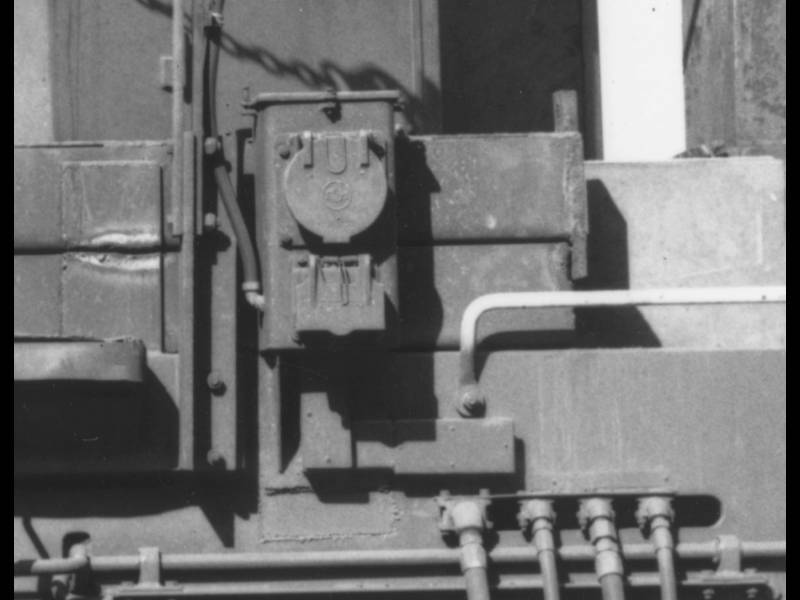 And since the MU connections on F-units were above the rear engine room door, it may have been discovered that the field loop cables were just short enough that problems arose when connecting to a K-M. Moving the MU box a few inches higher was likely a more efficient solution than making new cables for an obsolete system being phased out. The photo below shows the distance needed to be bridged. SP 9010 retained its rear M.U. box in this raised location. One possible in-service mod is difficult to chart because it's so tiny as to be indistinguishable in most photographs. This is an upgrade to the radiator header tank sight glasses. As built, there are two of these per side, centered on the hip of each radiator hood. 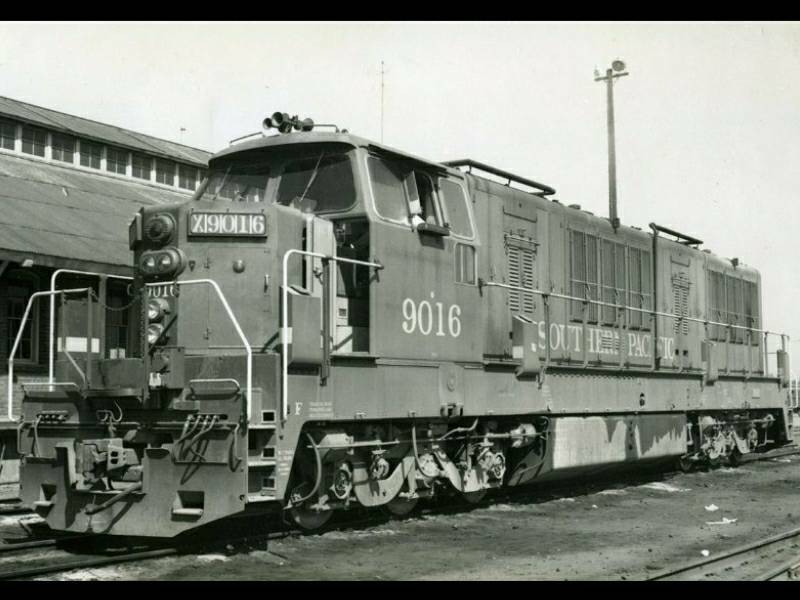 Early factory photos show a round-lensed version on the "Nr.1" unit (presumably SP 9003). The part shows a single round lens to the front, when observed from the fireman's side. Other factory photos show two lenses facing forward on the engineer's side. Closer study reveals (when facing the hood at right angles) that the right-hand face holds two lenses and the left-hand face holds one. This allows full coverage, but means that for a complete assessment of the water level, a trainman would have to look at both sides. 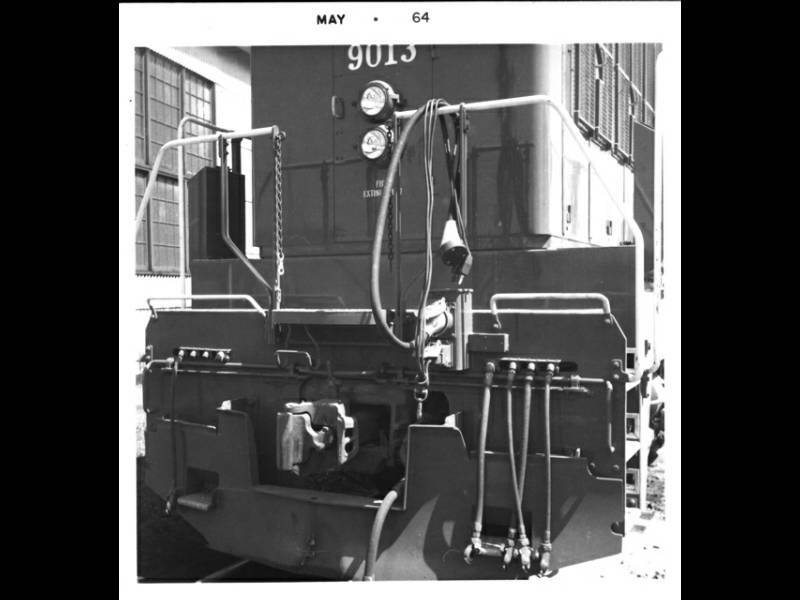 Photos presenting enough definition to see these parts suggest that the entire first batch of units, 9003 to 9009, entered SP service with this "bullseye" style of sight glass. 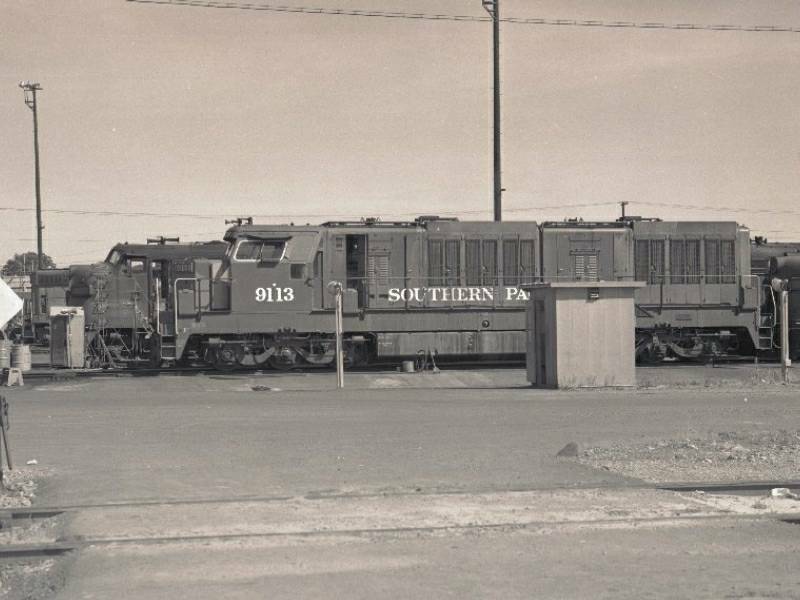 But there are also in-service photos of SP units equipped with only one sight glass on a given side (SP9008), and two units with none at all, at least on one side. 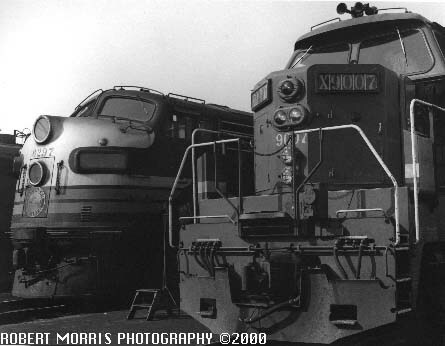 (SP 9003 in February of 1965 and SP 9007 as early as March, 1964.) Perhaps once a decision was made to replace the early parts, they were simply removed and blanked off while upgrades were being procured. The second batch, 9010 to 9017 appear to have been delivered with the later style glass. 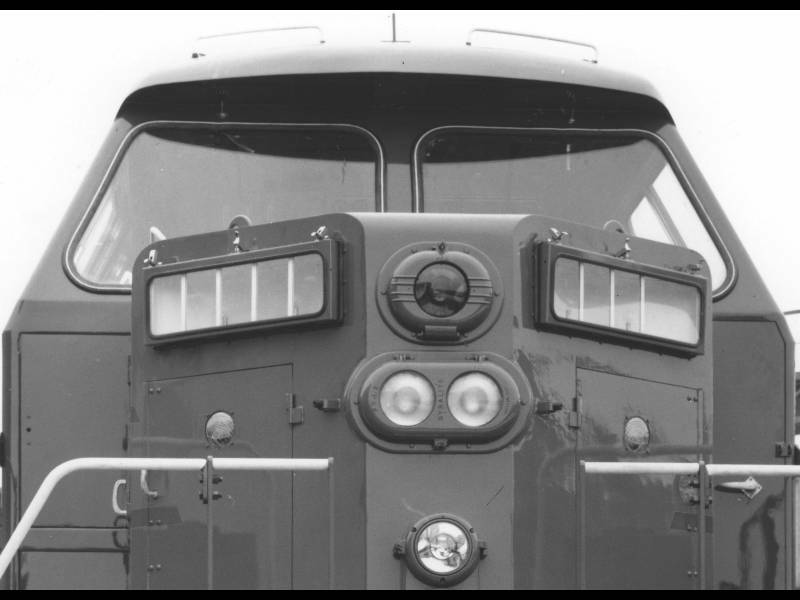 Eventually the sight glasses appear to have been changed on the early units to the more prevalent window style pictured below, readable from either side equally. Big room, nice seating, great visibility. The Germans must have been so proud in the beginning. 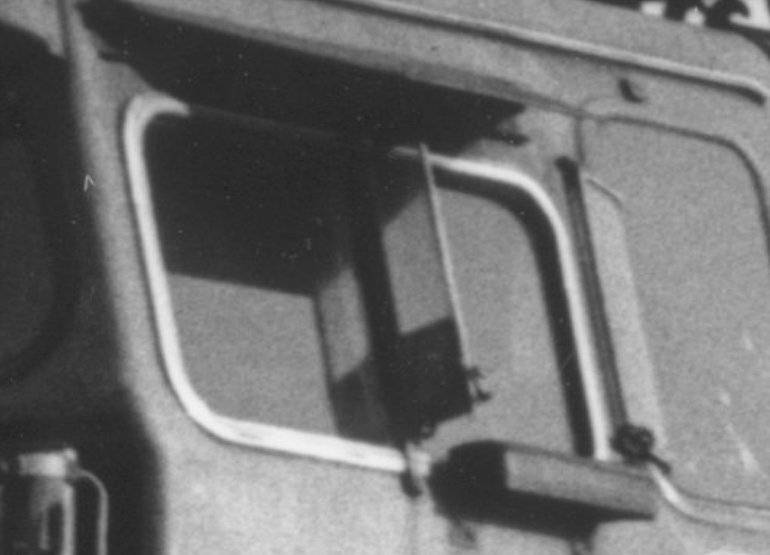 The original 1961 cab units featured a ‘turret’ cab with rear windows, and large picture-window glass all around. 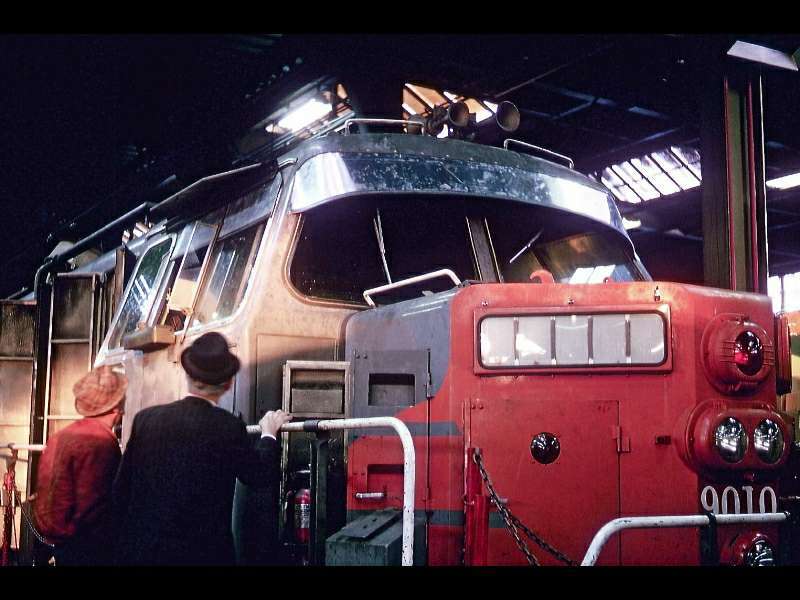 The 1964 hood units upped the ante, with even larger windshields, more glass behind the crew positions -- even a crank-down window just as you stepped in from the rear, perfect for taking the air while standing at walkway height. 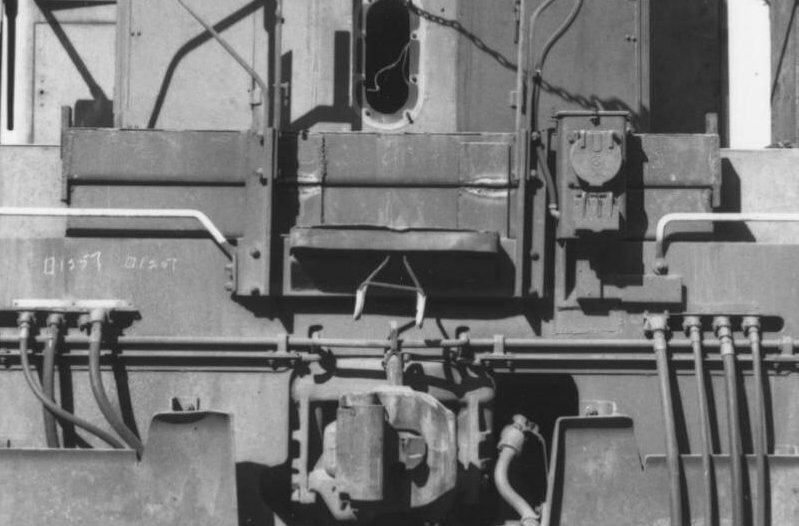 More significantly, since the K-M cab floor was higher than the average diesel-electric's (to clear Cardan shafts and gearboxes), those windows also offered a perch for an Engineman to stick out his arm and grab train-order "flimsies" on the fly. For viewing the Bavarian Alps, spectacular. For viewing the High Sierra in February of 1964, splendid. A room with a view. 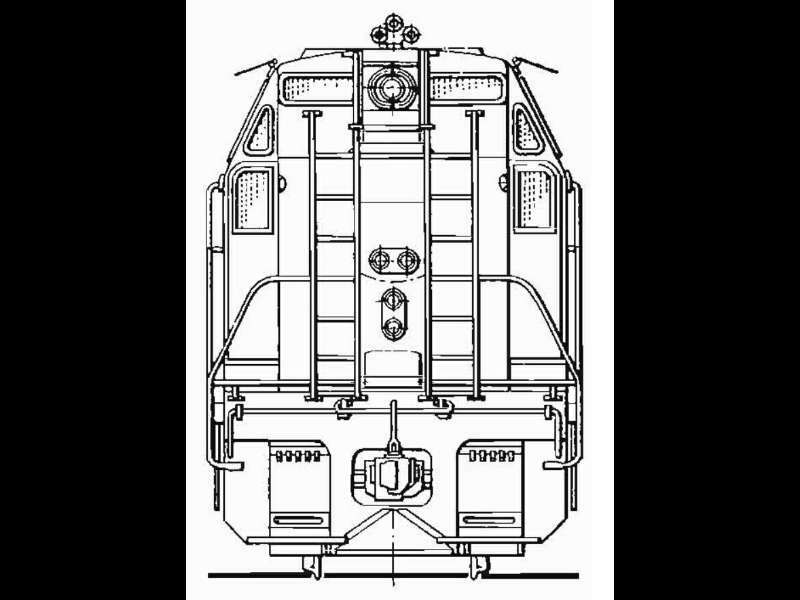 Now, factor in a rakish European ‘tumblehome’ of the upper cab sides; not a K-M stylist’s whim, but dictated by European clearance plates, and a must for the locomotive’s testing and movement between shop floor and port. Then, put yourself in that unit -- in a blistering Fresno in July. Or a thundering, soaking Tracy in November. If the heat and the sun didn’t fry you in summer, the torrents of rain pouring through those canted sliders would soak you in winter. The Germans may have been chagrined. But the SP crews? They were simply miserable. Some eyewitnesses recall the Sunday comics being taped inside those windows as an improvised solution! 5.) First relief: sun visors and short window ‘kits’. Additional windshield visors started appearing first. A majority of the fifteen hood units eventually sported them. 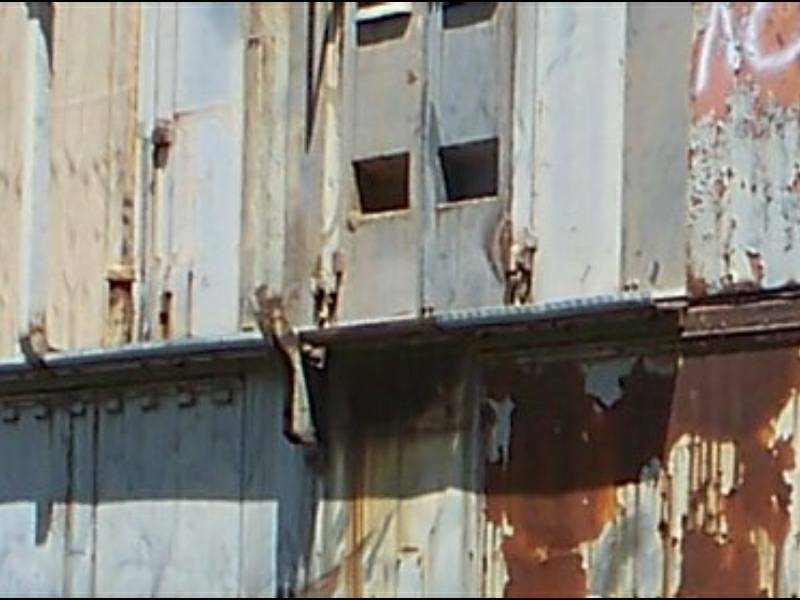 These appear to have been fabricated from aluminum, since many photos reveal peeling paint over a silver substrate, and a definite ‘oil-canning’ waviness. 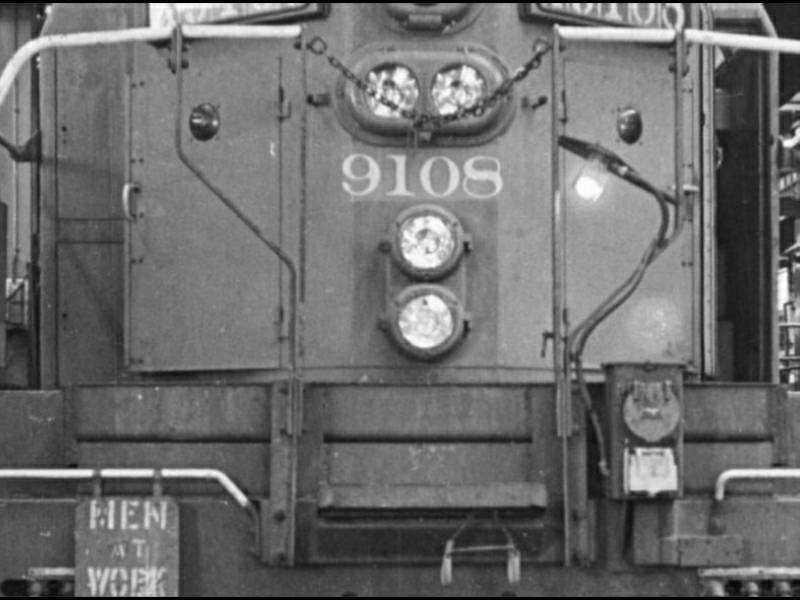 A recently discovered photo, taken by a German technician working in Roseville, shows that our own SP 9010 may have been the first experimental candidate. 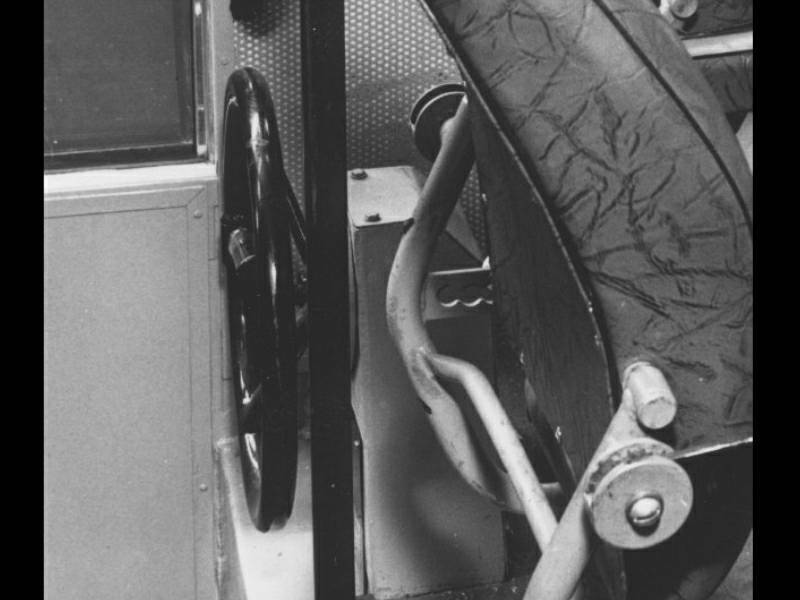 A visor was constructed for the windshield from what appears to be galvanized steel sheeting and vinyl "pinch welt" upholstery trim -- larger and of a different shape than the final application. 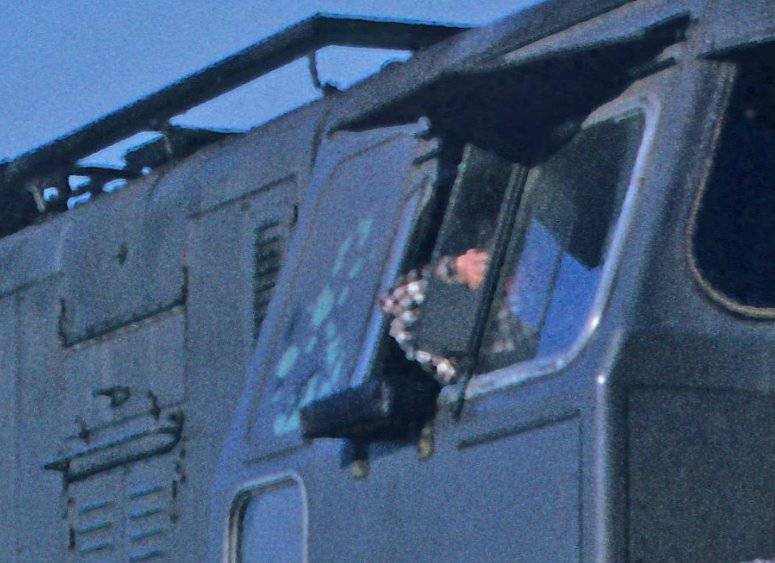 The cab sides were blocked with "blinds" from the same material. The photo shows what appears to be a couple of concerned Bavarian observers in March of 1965, as the late afternoon sun seems to cooperating with the experiment. This experiment may have inspired K-M to offer a factory-built "kit" to the SP, as some have reported. Whatever the source, SP eventually added a ‘plug’ to the upper sliding windows, lowering the top edge and offering some extra shade and shelter. The extruded aluminum window channel molding was ‘sectioned’, and a boxed patch of steel welded into the upper carbody -- resulting in a sinister look that pre-dates Darth Vader by a nearly a dozen summers. Not all fifteen units received these window modifications. 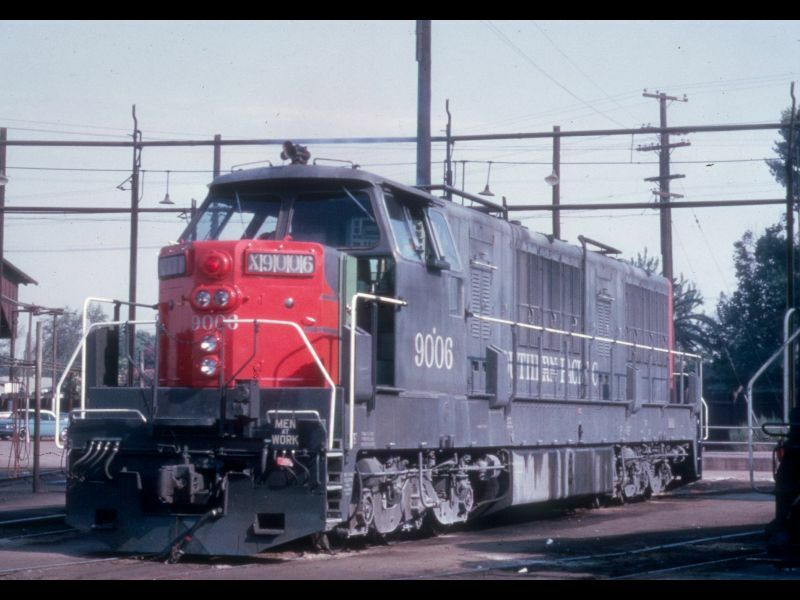 But a majority did – some while still numbered in the original 9000-series. 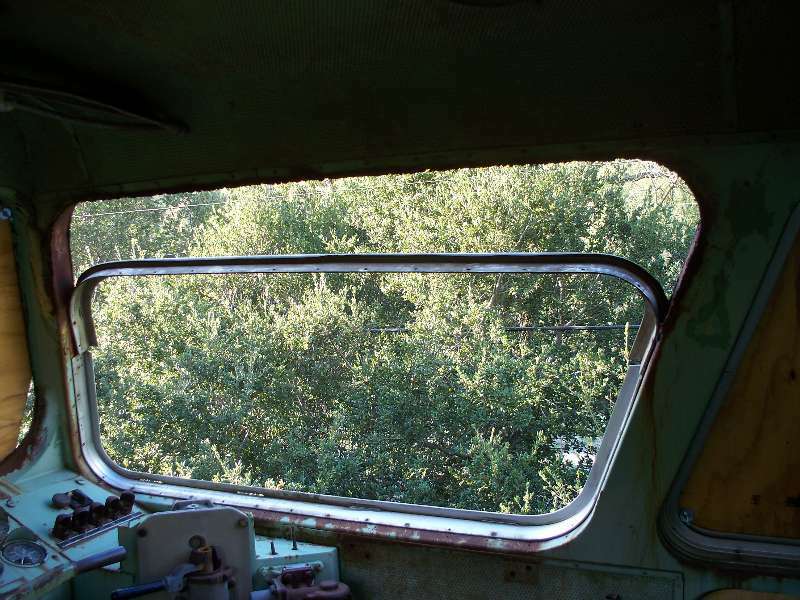 The last glazing modification to combat cooked crewmembers was to paint out the large upper rear cab side window, from the inside and outside. Photos show Sea Foam Green showing to the outside in patches, as the exterior coat of Lark Dark Gray loses its grip. Restricted glazing was not all that the SP attempted to cool off their boiling engine crews. 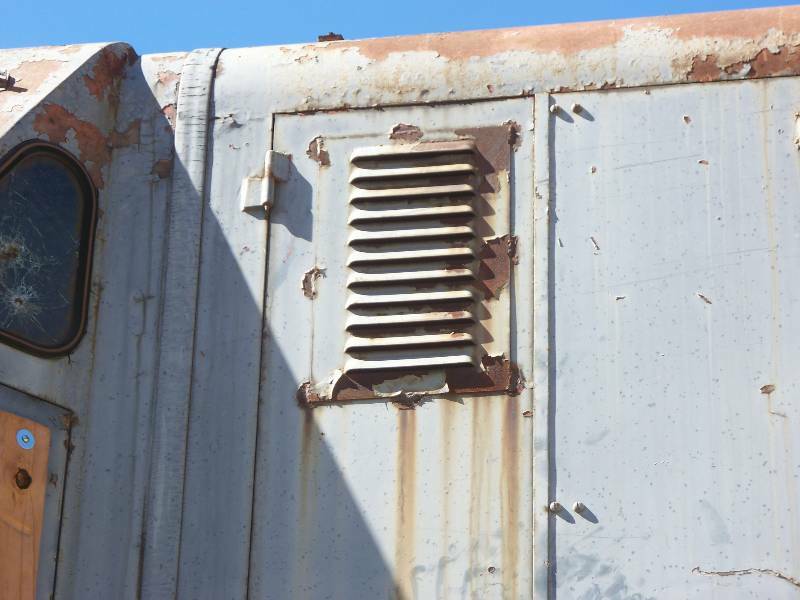 A round ‘Prime’ cab vent – typical U.S. issue -- was apparently installed by the SP on several units, and some of these were accompanied by a curious rounded-top steel deflector plate. What this deflector actually deflected is currently up for conjecture. 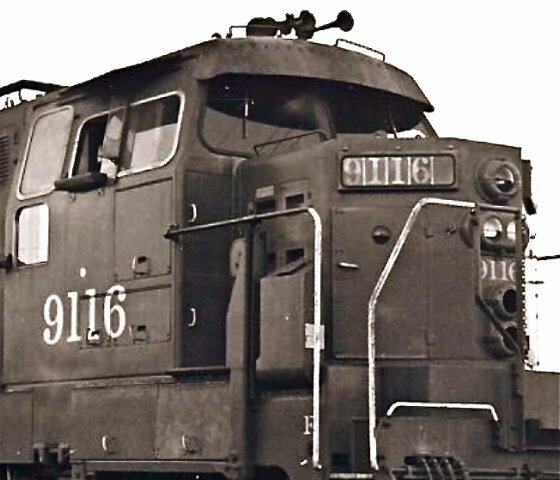 One thought is that it kept the reversed bell of the Nathan P3 Air Chime from blasting its overwhelming dB’s into the newly-ventilated cab. We can’t be sure from photos if a given unit received only the Prime vent and not the deflector – the angle usually prevents detection in photos taken from the ground. But if there’s a deflector plate visible up by the horn, we can assume it was there to ‘protect’ a vent. 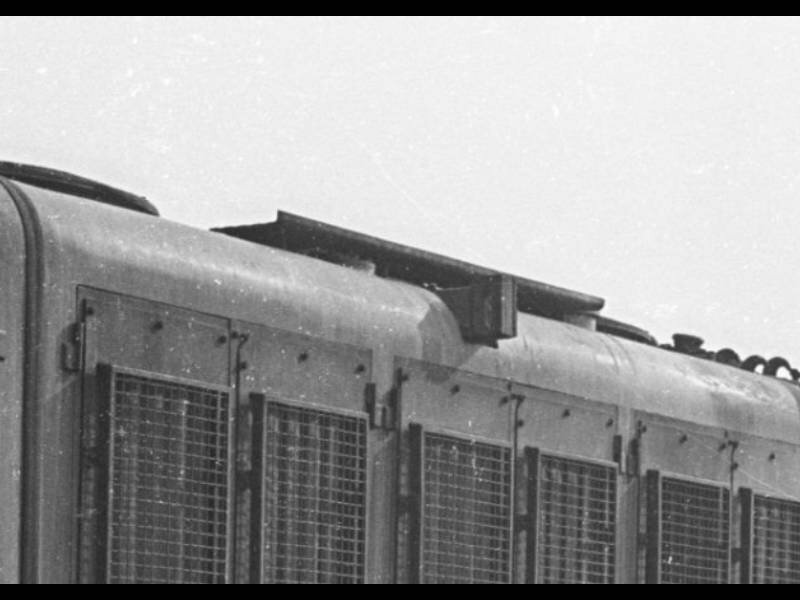 And finally – note these louvers in the first door of the long hood, up high and immediately behind the cab, on both sides. One can only suspect these were an effort to keep just a little more heat from transferring through the back of the electrical cabinet and the ‘W.C.’ and thence into the cab. Judging from their size and location, and that they only vent a bit of the air space of the forward engine room, this may have been little more than a visible but token effort. 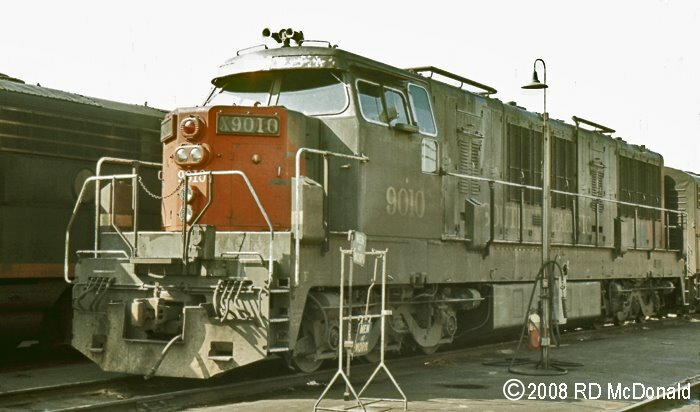 SP 9010 received all the above comfort-related modifications, but lost its windshield visor during the uncompleted restoration attempt in the 1990’s. 8.) Platform lights, Phase One. The hood units were built with handsome aluminum-framed step lights, sourced by the light from a caged bulb under the frame. But for some reason, K-M did not also include platform illumination. At some point, someone may have noticed that headlights don’t normally shine in trail, and thus, do not incidentally illuminate the black hole when stepping across the void to a trailing unit. So they added a small platform step light to the front sheet metal filler above the pilot walkway. It’s hard to be sure -- but judging only from photographs, it seems whoever wrote the specs on this installation did not require an overdose of neatness in the execution. 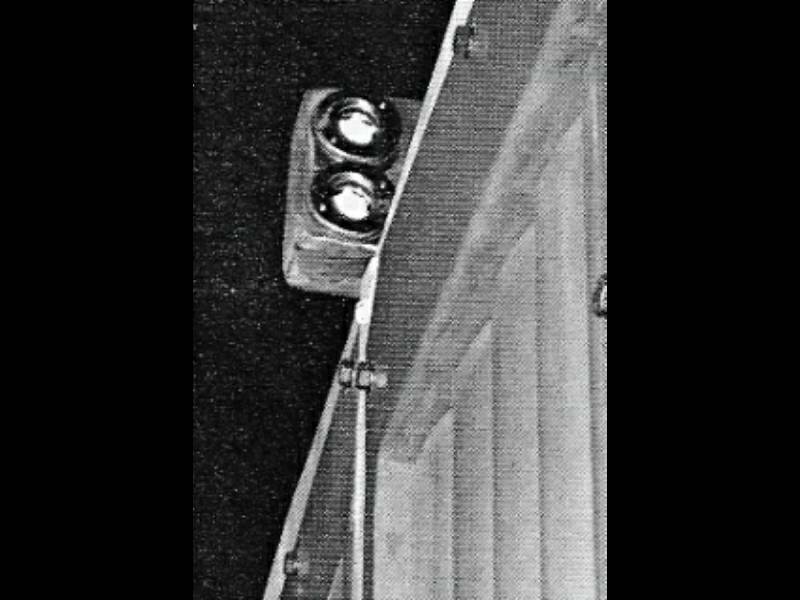 SP 9010’s added step light – and that of every unit above except 9118 -- was replaced during the mod discussed next. 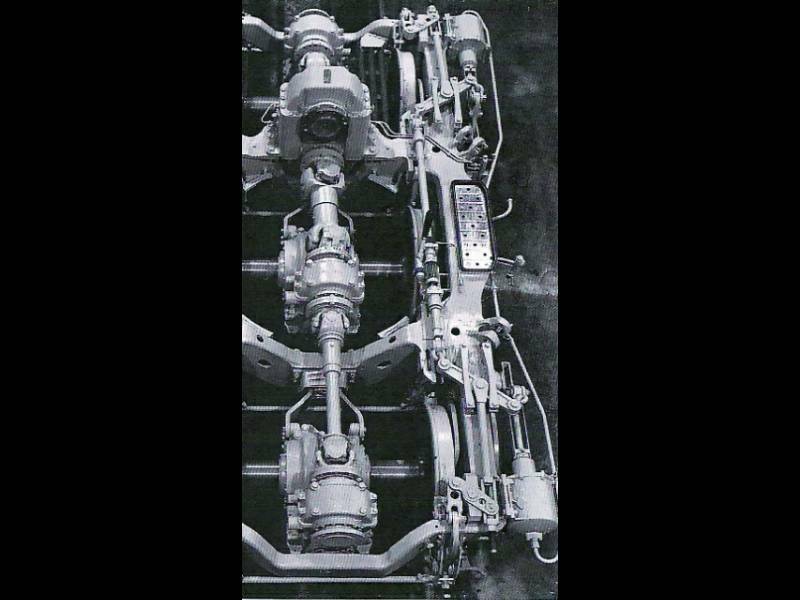 The K-M’s hydraulic drive was touted as the ultimate solution to wheelslip issues – indeed, this quality (in addition to the ability to deliver high horsepower) was their prime rationale for existence on the SP. Diesel-electrics can slip each axle individually. But on the ‘hydros’, three axles and six wheels are always turning in lockstep. There was a sandbox over each truck corner, and a white wheelslip light on the 'dash', triggered by a G.E. axle generator on each truck. Automatic wheel slip control included automatic sanding and power reduction on the affected unit. 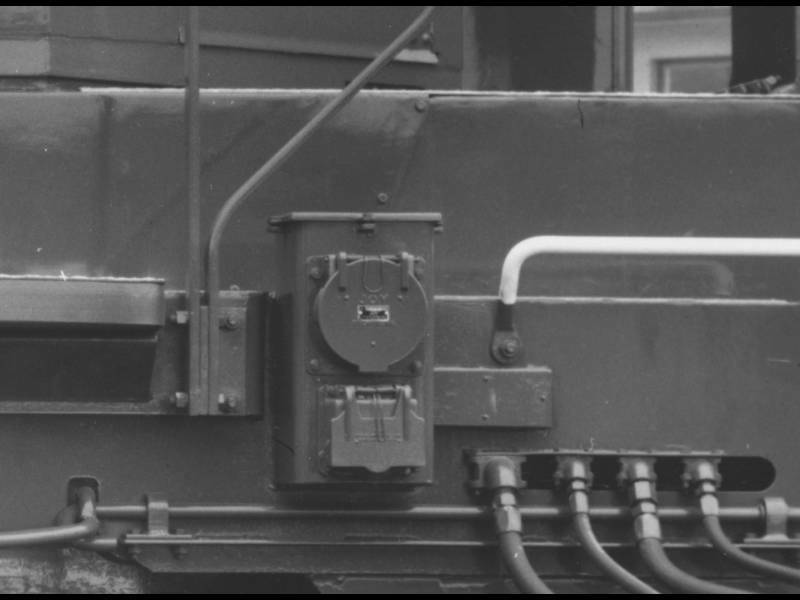 In worst-case scenarios, there was also a toggle switch on the 'dashboard' that would reduce power to the lead truck, from 2000HP to a max of 1250. But K-M wheelslip still occurred, and was perhaps even more aggravating to crews and management because of the hydro’s haughty reputation. 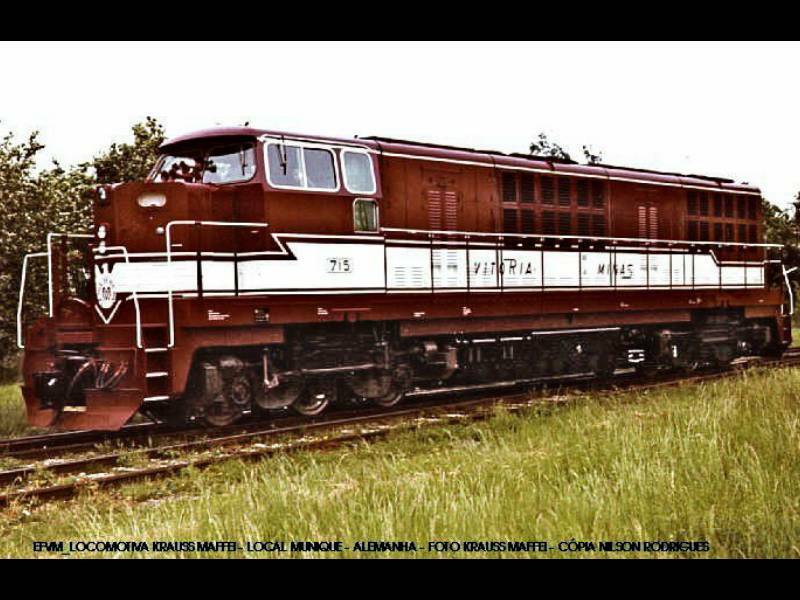 In fact, stories out of Brazil have the essentially identical 1968-model ML4000C’C’ units of Vitoria a Minas slipping so badly that repairing evenly-spaced divots in a melted railhead was a normal maintenance item. 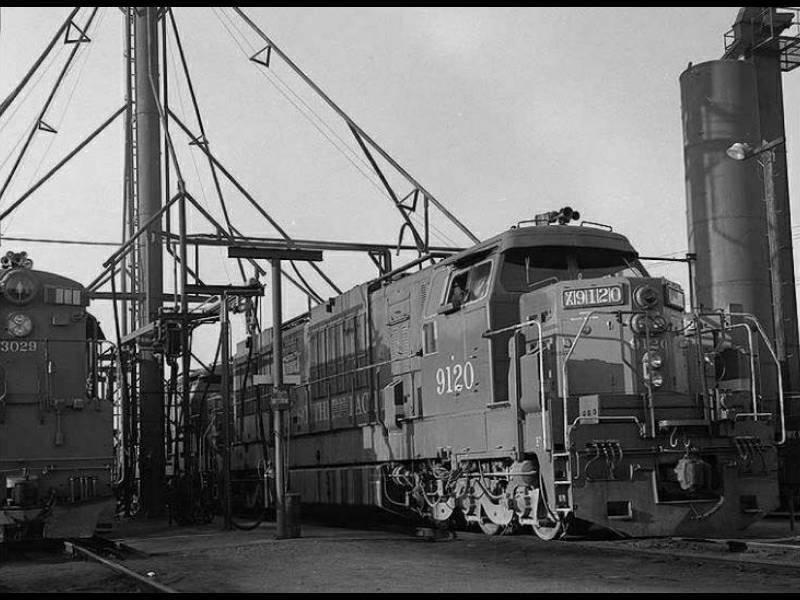 Published records also indicate that SP 9110 had its weight boosted in December of 1965, increasing its weight at delivery by nearly nine tons. SP 9117 is on record at the same time with a boost to its birth weight of more than seven-and-a-half tons. But photographic evidence shows that all but three units received at least some extra ballast. SP added weight to the K-Ms in a number of locations not fully documented yet. SP 9010 reveals added weight at the backs of its frame-level battery boxes. But the most apparent location was over the pilot platform on the front ends, ultimately seen on twelve of the fifteen hood units. 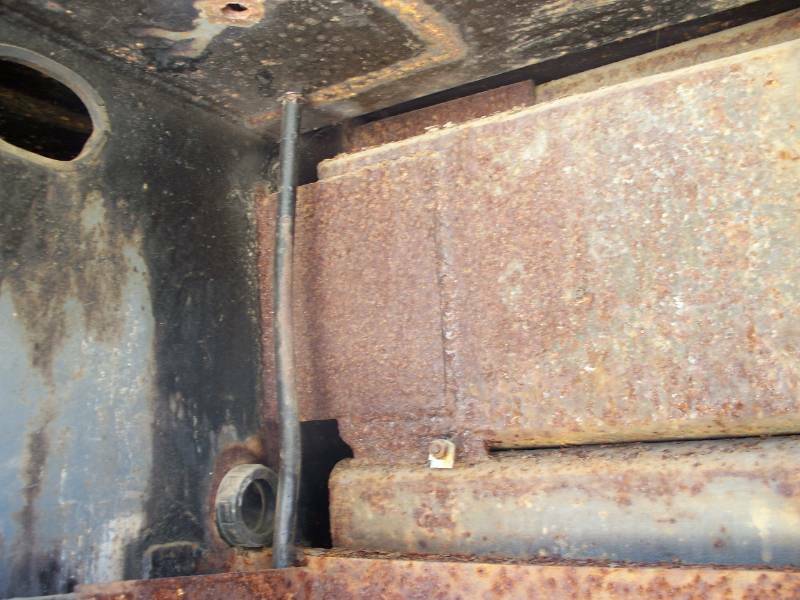 This ballast appears to be added using a standard SP method, employing solid billets of square-section bar stock, welding and bolting them into place. 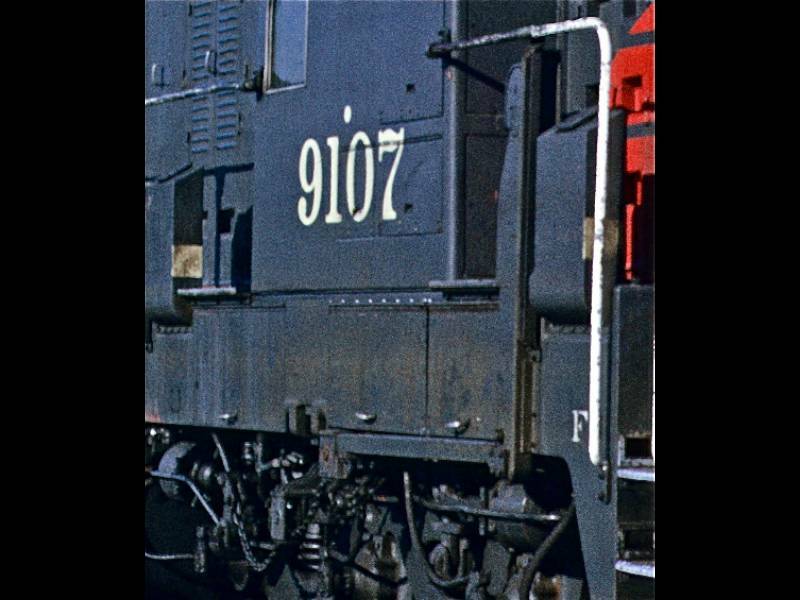 At least three units -- 9107, 9109, and 9110 -- received a more ‘smoothed-out’ set of weights, likely a sheet metal cover and perhaps concealing even more weight. The added volume of the weights raised the effective height of the platform walk area. Front handrails were raised on the affected units by simply raising the factory assemblies, adding angle iron support brackets to the center uprights, and a handrail tube extension on each side. One incidental aberration: SP 9108 appears to have been re-assembled backwards: the ‘short kink’ for clearance is not over the M.U. box, and there’s a definite rearward offset to the handrails, as if they’d been muscled into position. Finally, a what appears to be a standard EMD-style ‘ground light’ was attached to the left-hand stanchion assembly, as a platform step light. 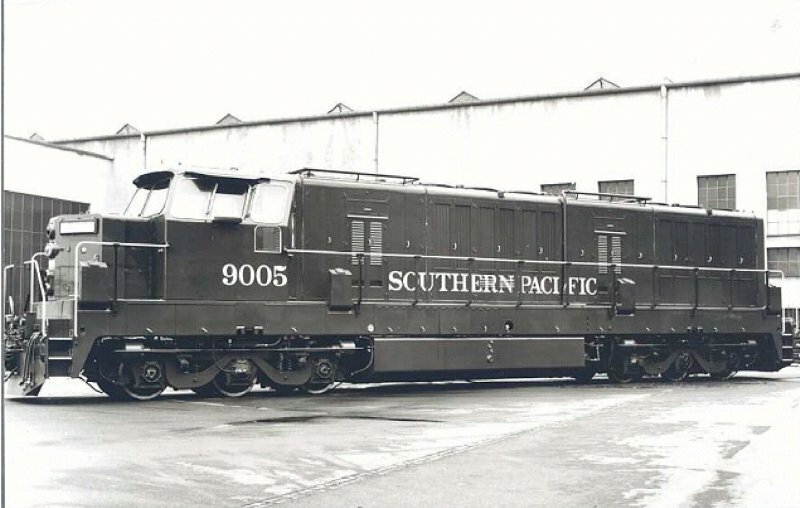 SP 9010 received this complement of front-platform mods, but they were removed when the forward platform and pilot were stripped during the unit’s conversion to ‘Camera Car’. Standing tall over each forward hydrostatic radiator cooling fan (yes, even the fans were hydraulic!) was a modification that may have come out of the K-M’s eventual superheated life in the San Joaquin and Sacramento Valleys. This assembly appears to be a supplementary external heat exchanger mounted on a ‘bridge’ over the cooling fan grates. 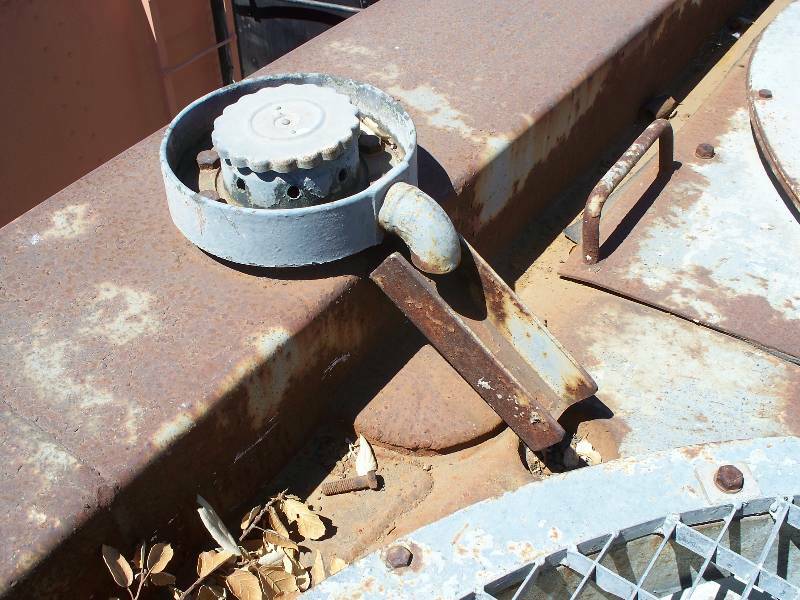 Inspection of the remaining connection lines show no trace of oil or hydraulic fluid, so it appears that they were tapped into the water-based heat exchanger system. Exactly what they helped to cool will take more inspection and research, but the strongest theory suggests that it was for the Maybach V-16's water-cooled turbocharger bases. Each unit is mounted above the forward fan of each hood group – one would assume to keep it in the slipstream of cooler air (at least if the unit is operating nose-first), and to be subject to the highest velocity of forced air at the outer rim of the fan. The modification appeared on several units. Plumbing is unclear in most ground-level photos. 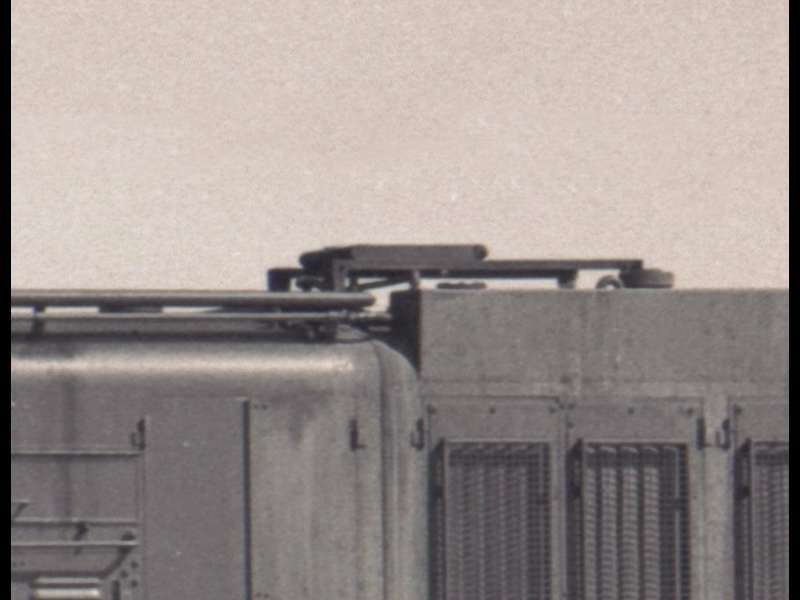 An additional hard line is visible on the roof of SP 9107, underneath the air aftercooler piping and piggybacking on its brackets. 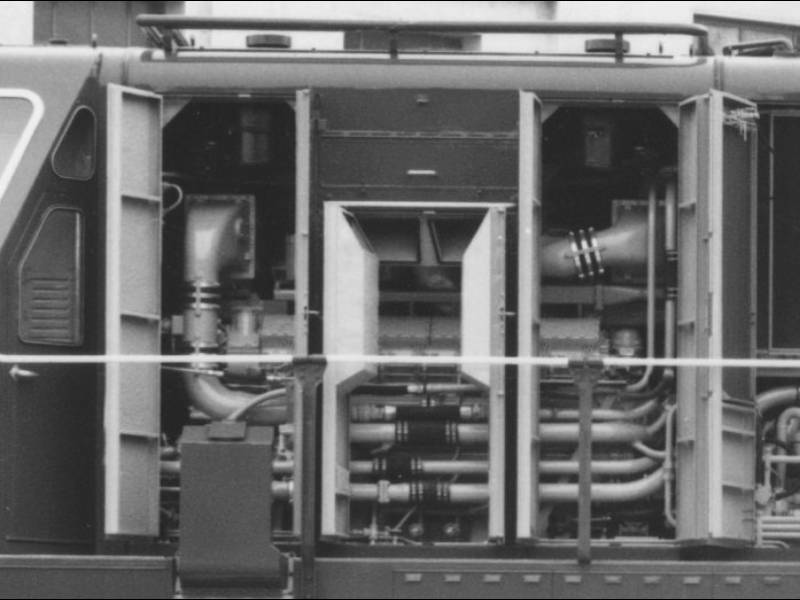 SP 9010 was equipped with these coolers when running as SP 9113. The heat exchanger elements and piping were removed when the unit was converted to ‘Camera Car’, but some footings and brackets remained. Capped pipe ends also remained on the hood tops, but precise pipe routing has not been determined. Here’s a case where looks can deceive -- these odd devices are not what they’ve been presumed to be by many observers through the years. Each Maybach V-16’s exhaust outlet was equipped with two ‘butterfly trap doors’ which opened a bit short of 90 degrees when the prime movers were making power. But this is not, apparently, how the first seven units came off the assembly line. Original K-M drawings show a large, sunken opening in the hood top, and those butterfly doors sit at the crown of an "uptake pipe" which hides well below rooftop level. There is also a collector pan below the exhaust outlet which is likely designed to catch errant rain water and keep it out of the engine Vee. Basically it looks like the exhaust left the trap doors and exited through a large hole in the roof. 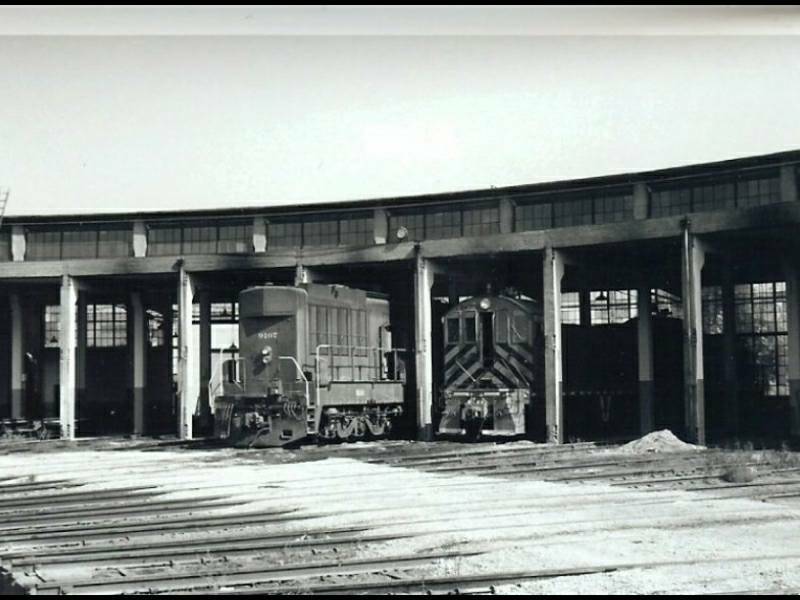 This is borne out by the photo below taken in May of 1964 when the unit was quite new, as well as factory shots of the roof profile. Possibly the exhaust was short-cycling into the intakes with this arrangement -- it had been occurring to the "cab" units already and had caused burned intake valves. It appears that a spacer was inserted in the uptake pipe, so that the butterfly doors and outlet were now peering slightly above roof level. This apparently created a new problem -- oscillation of the new, taller uptake stack. 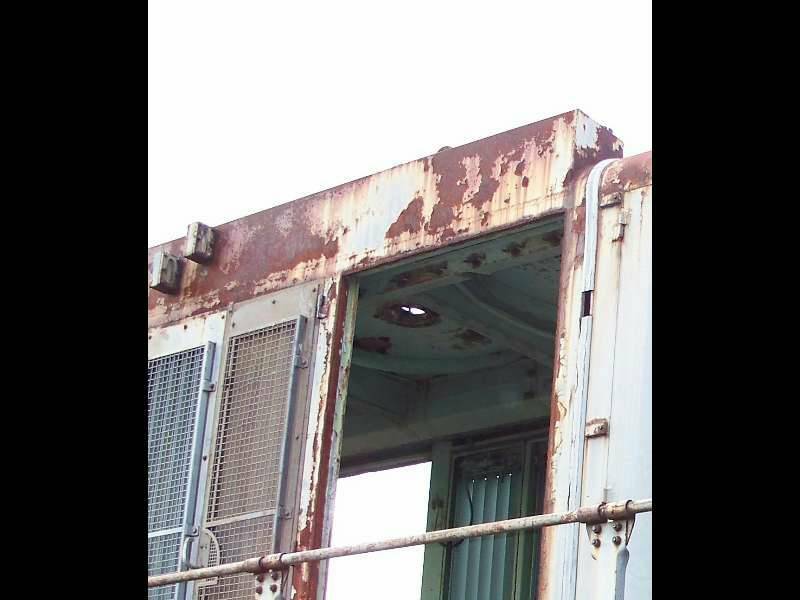 When these little spring towers began appearing on cab and hood units alike, the assumption by proximity was that they somehow acted as closing springs or limit buffers for the butterfly trap doors. In fact, the trap doors close by gravity and the geometry of their hinges. And those springs don’t connect to the trap doors at all, but are clipped between the pyramidal towers and the exhaust stack itself. So they’re almost certainly a centering device, meant to keep the new taller stack assembly from gyrating or otherwise getting out of control. The exact nature of this unwanted motion is still waiting for more information and discovery. These theories will have to wait -- either for the twin Maybachs to volunteer their story, or for documentation to surface. Those narrow walkways were further impinged by four rectangular sandboxes per side. Jutting a fair bit inside the handrail stanchions, they doubtless posed a hazard to nighttime crew navigation. 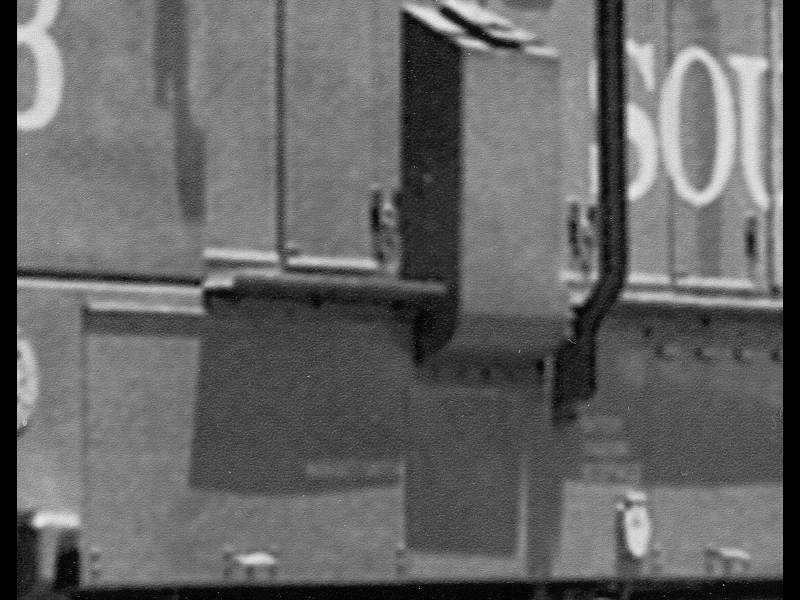 All units received what appears to be Scotchlite-brand reflective striping on the inner faces of all eight boxes, appearing in 1964 and certainly before 1966. 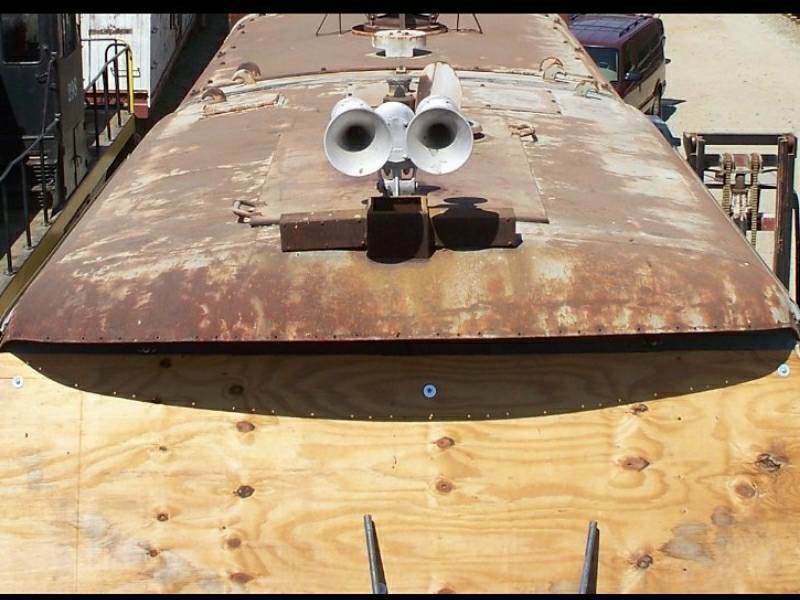 SP 9010 had its sandboxes removed during conversion to Camera Car, and the areas were plated over. 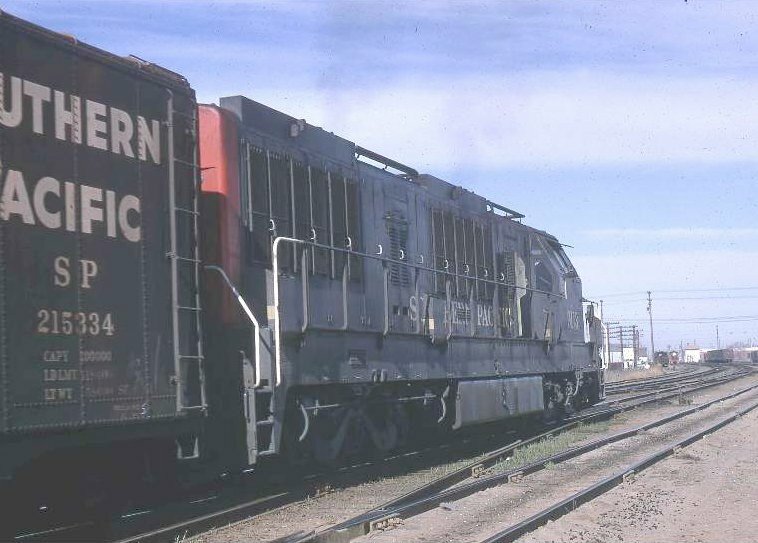 The 'voice' of the K-M hood units was the Nathan P-series Air Chime -- specifically the P124, or 'P3' in shorthand. This horn is the one most identified with the Southern Pacific, and sounds a simple and pleasant A-major chord. 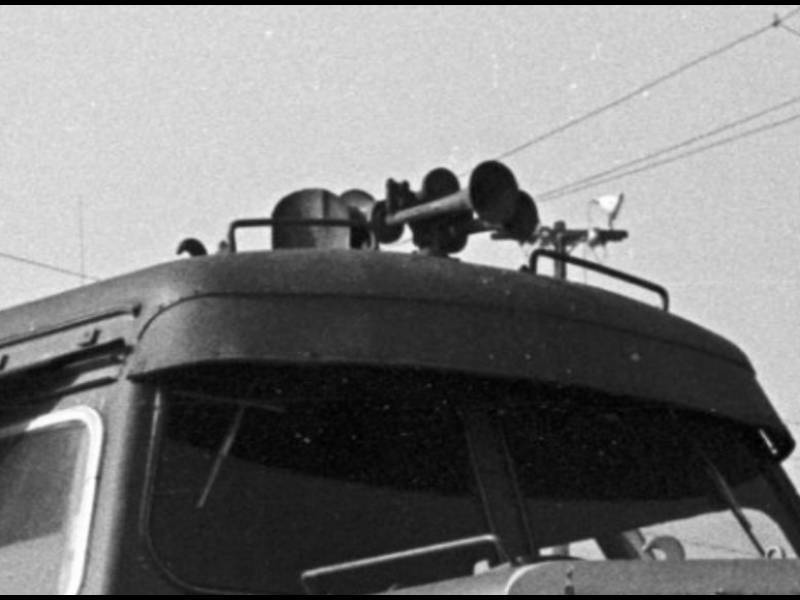 These horns were originally mounted on temporary brackets, and the bells reconfigured to face forward, to meet European clearances when operating on German rails. 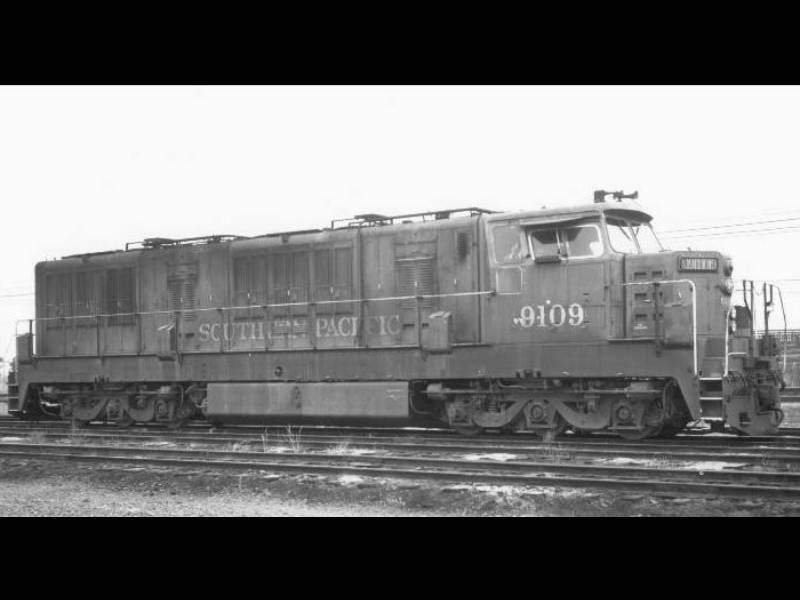 SP 9010 only carried the M-3 for a short time, and ended its career as SP 8799 'Camera Car' sporting the more common P3. 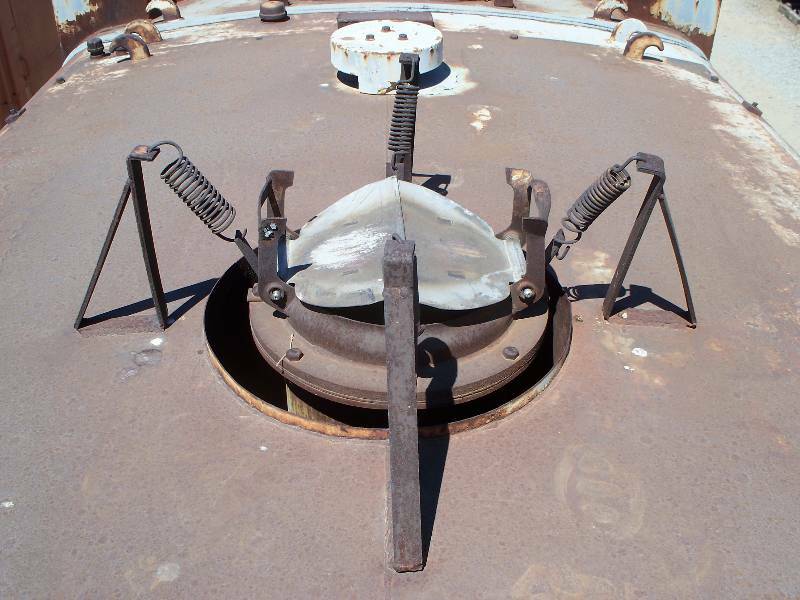 Most readily noticed of all the modifications received by the K-Ms through the years are the squared-off extensions to the radiator header tanks. 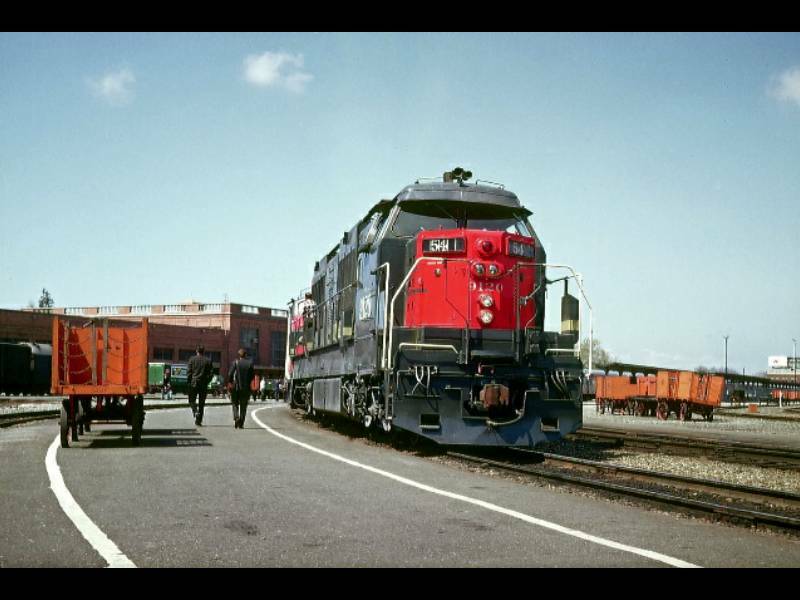 This highly-visible modification occurred in Sacramento over the winter of 1966-67, during what the SP called the ‘R7’ overhaul. Maybach V-16 prime movers were also upgraded. 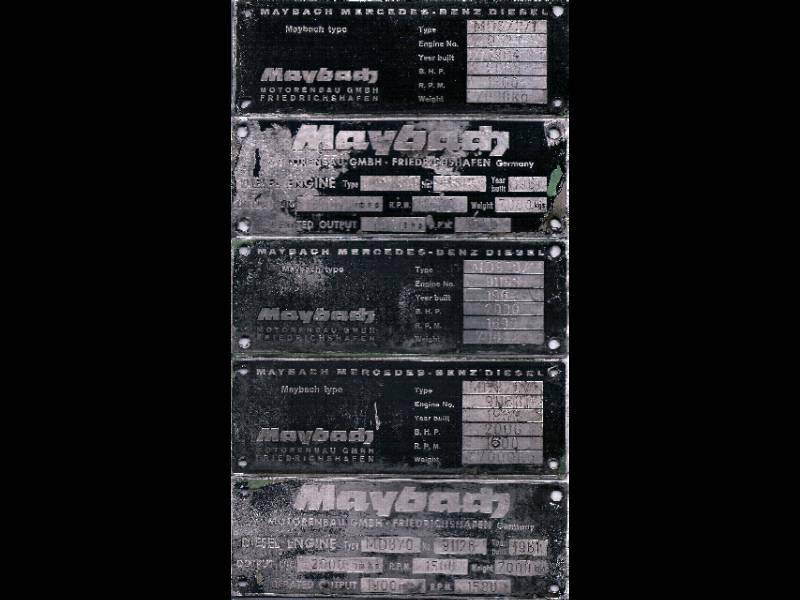 Of note: a few preserved data plates from the Maybach prime movers provide us a record of engine swaps and upgrades without apparent regard to original chassis number. 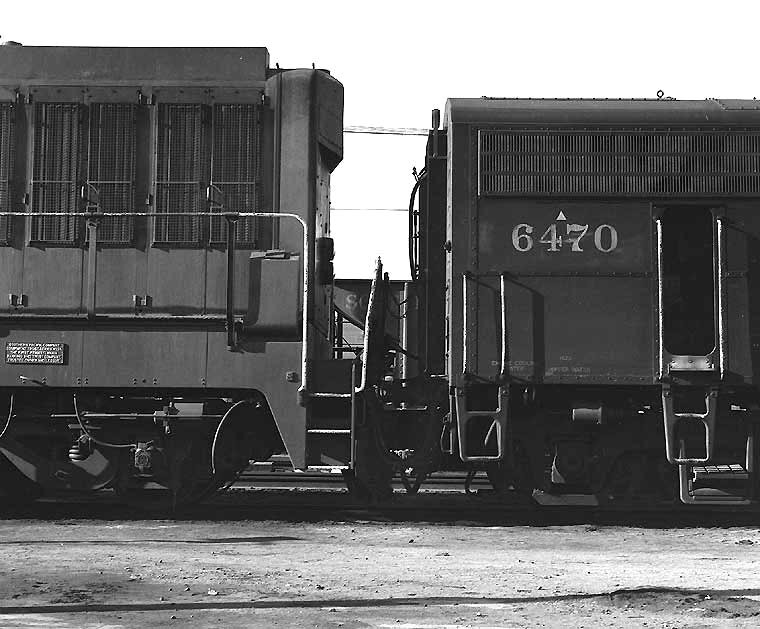 MD870 V-16 engines from the 1961 cab units were rebuilt and installed in 1964 hood units, completely mix-and-match. Also of note: the cab unit Maybachs all appear to have been built in 1961. 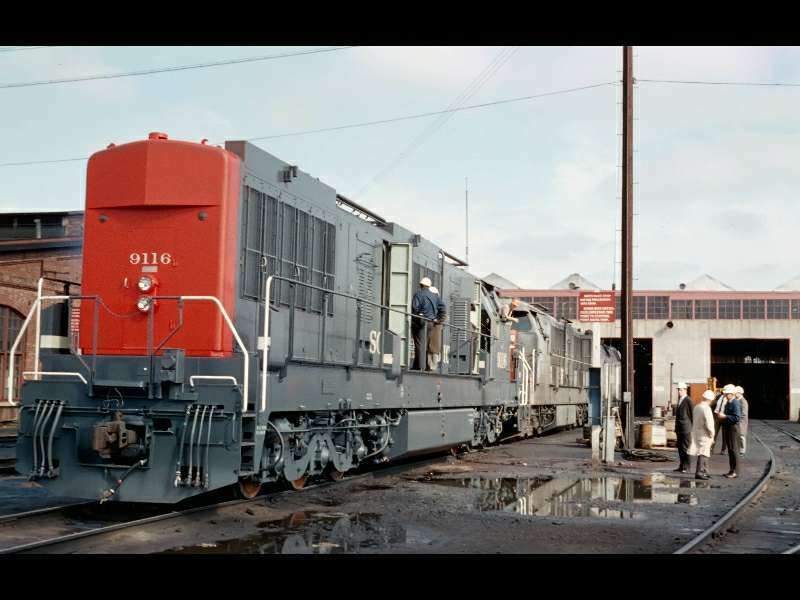 But some hood unit prime movers were built in 1963, coming down the line slightly ahead of the January and February 1964 hood unit completion dates. 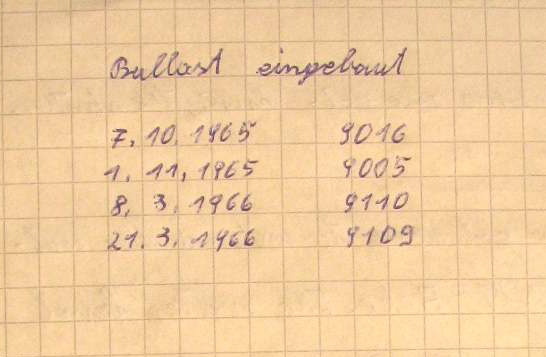 Others show a 1964 build date. SP 9010 may have one Maybach of each vintage: the forward or "Nr. 1 Motor" is serial 91168 likely built in either 1963 or 1964. The rear or "Nr. 2 Motor" is serial 91120, likely built in 1961. No records have yet surfaced tying the Maybach serial numbers to locomotive chassis numbers. 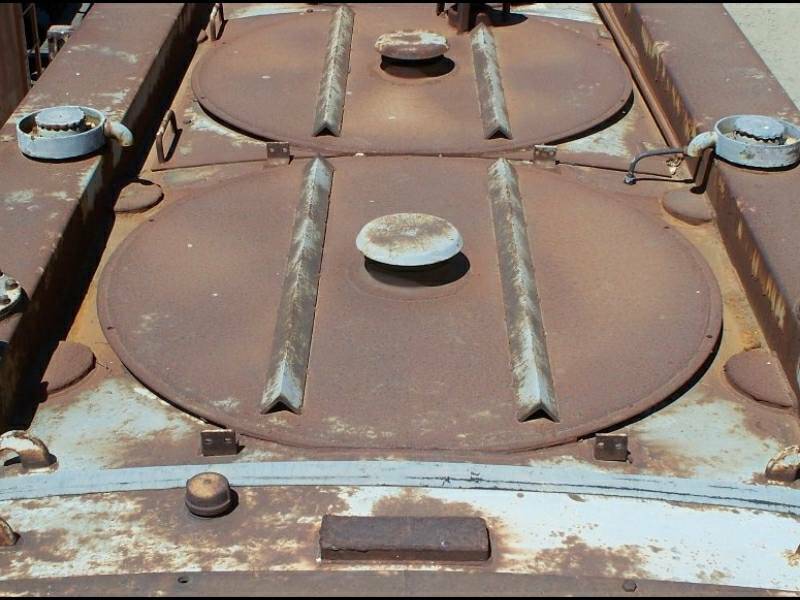 On the new tanks, the original filler caps, access covers, and crossover equalizing pipes were re-installed in the same relative locations as before. New equalizer pipes were fabricated, since the originals entered through access caps eliminated by the new tank bodies. Of note: the finger-grip filler caps, similar to oil and water caps on contemporary Mercedes-Benz automobile engines. Replenishment of cooling water usually took placed at the more expected fill nozzle locations under the frame, but these rooftop caps were indicated in the K-M operator's manual as an alternate. Sight glasses were moved to the right (engineer’s) side only. 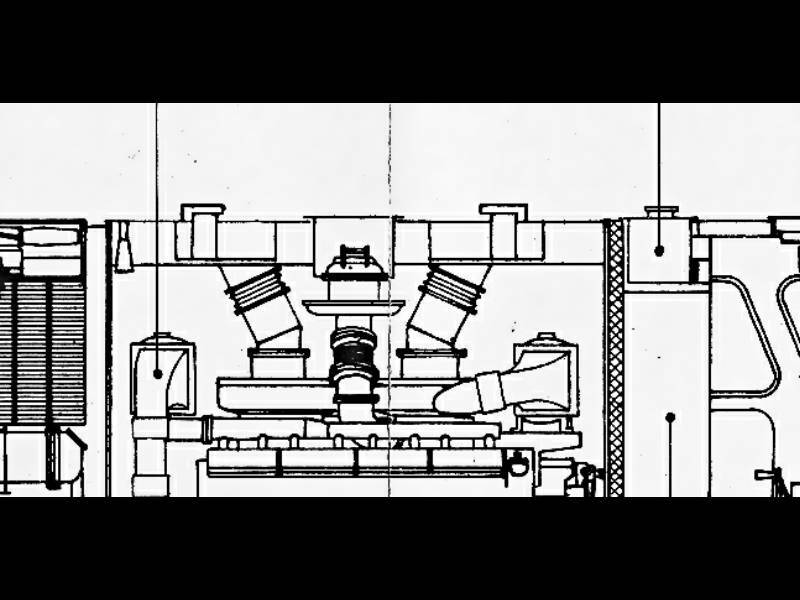 Since the original factory application featured one sight glass per tank on both sides of the unit, analysis suggests that the taller tanks presented a need for two staggered glasses – and economy dictated using only the quantity of parts on hand. 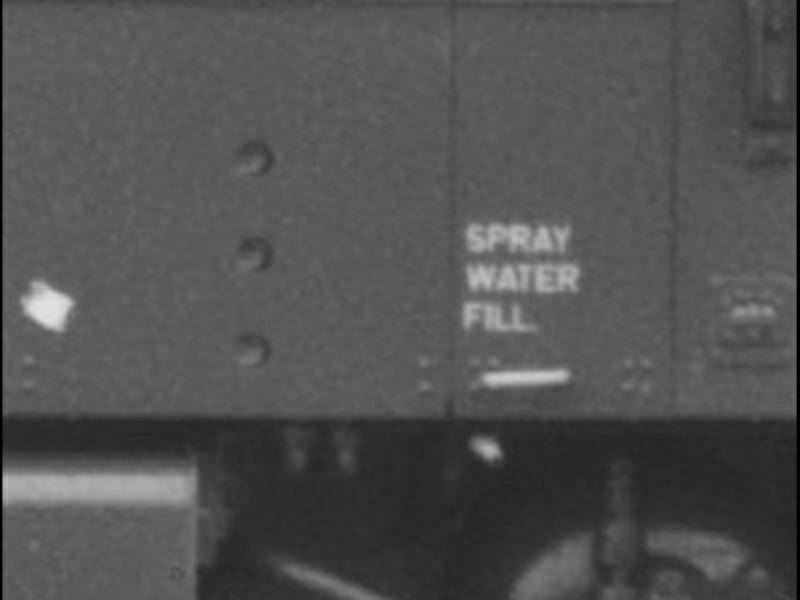 Of note: Troubleshooting tips in the K-M operator's manual say that in an emergency, water in the radiator spray system can be diverted manually to the engine cooling system. It has not been determined if this function was retained with the new, larger header tanks. 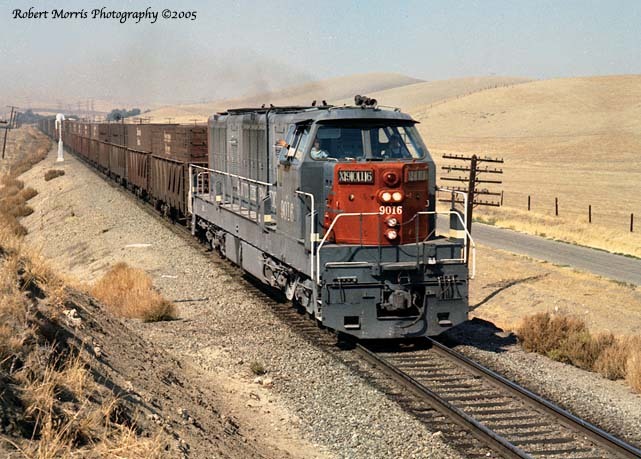 SP 9010: The squared header tanks remained after conversion to ‘Camera Car’ SP 8799. On the second axle, left side, connection for speedometer, "Barco"
A differential increase in axle speed between trucks is an indication of wheelslip, and since all three axles in a single truck were geared together, one G.E. 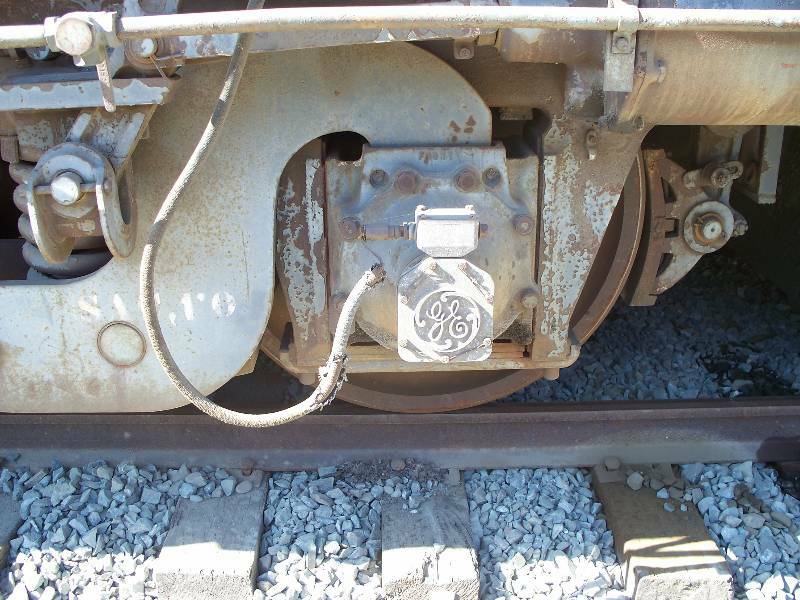 wheelslip detector drive head per truck was enough to support the detector function. In addition, the symmetrical and redundant application of wheel slip and speed recorder drives on both trucks would allow the swapping of trucks from one end to the other without also requiring a change of axle generators. After the R7 program, those four units emerged with at least one drive on every axle – typically resulting in three wheelslip drives on the forward right side axles, and three on the rear left side – plus a Barco speed recorder drive on the second axle, left side. It was eventually discovered by SP that rolling diameter variations due to uneven wheel wear would cause extreme torque stresses (sometimes called ‘windup’) to the gearing and Cardan shafts. 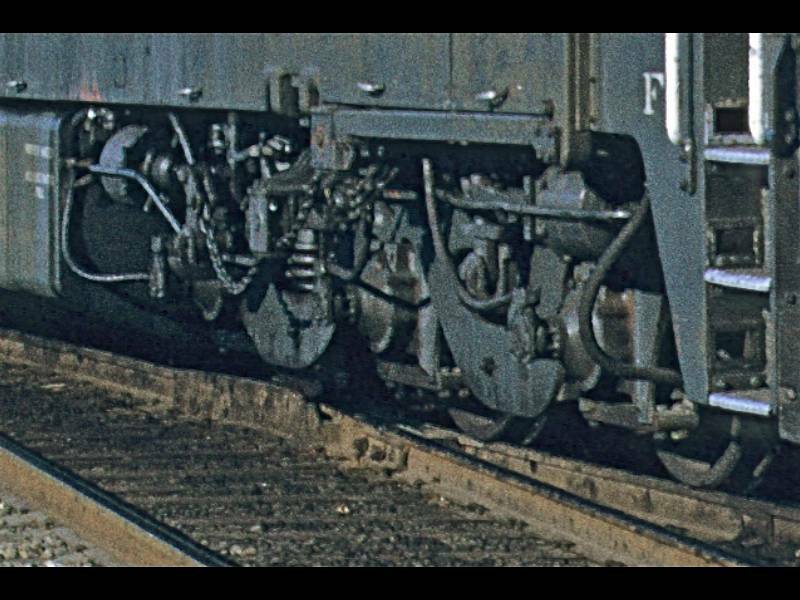 Gearboxes, axles and wheels were all known to have failed on K-M units, and stories tell us that those failures were not always immediately detected. It's likely that the monitoring of every axle was a modification designed to alert the engine crew to isolated failures in the final drive components. SP 9010 (as SP 9113) received the maximum complement of axle drives. As ‘Camera Car’ SP 8799, some were removed and some were relocated. The factory handbrake was a complex series of wheels, sprockets, chains, spur and worm gears, U-joints, and a lot of lubricated surfaces wide open to the elements. 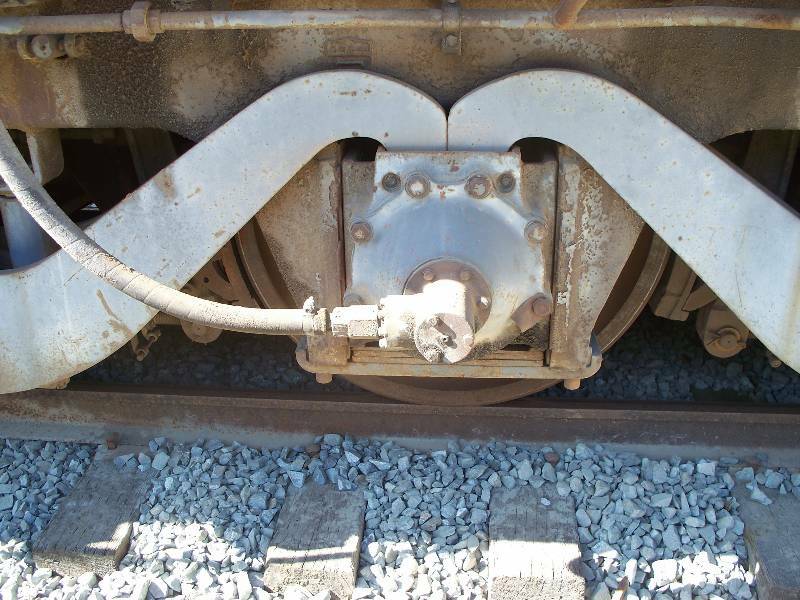 This original brake, actuated by a handwheel behind the fireman’s station, acted on the brake levers of the front truck, on the left hand side. The presumably intense German-style maintenance rigors, plus the complexity and sheer number of parts, may have led to the final modification under discussion here. 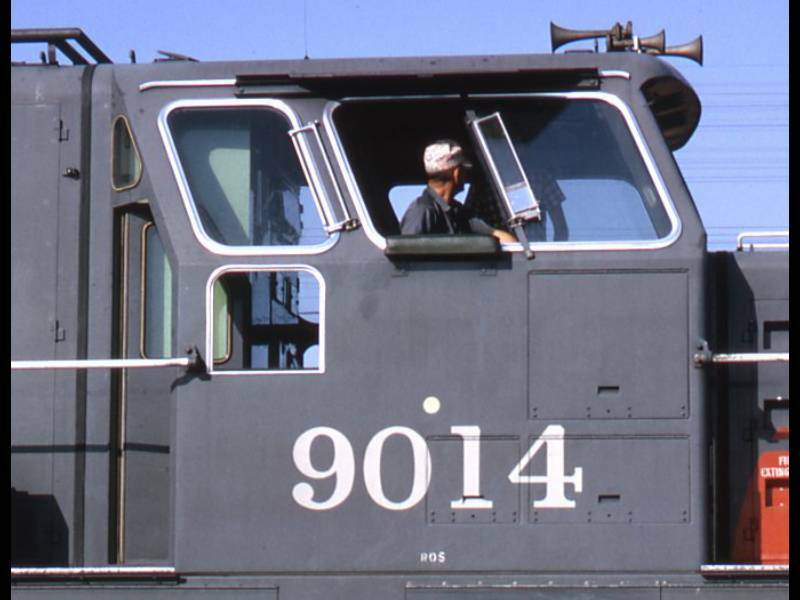 A lever-actuated stand was installed on the walkway ahead of the engineer’s cab, with an external 90-degree linkage acting on the right rear brake lever of the forward truck. 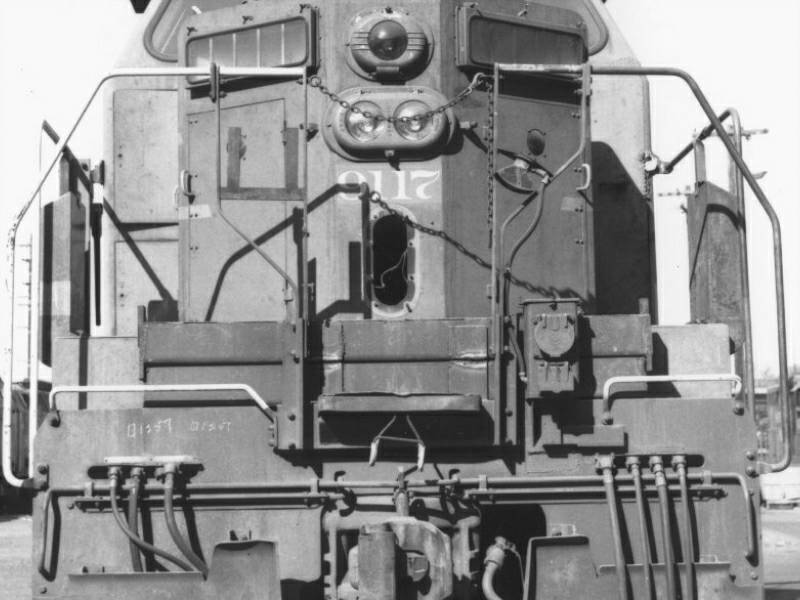 A support block was fabricated and welded to the right side of the front truck, in a style similar to the same device on SP’s three Alco DH-643 diesel-hydraulic locomotives. These may have provided an engineering model for the design. One of the most distinctive features of the K-M hoods are the finely-made aluminum latch handles on the hood access doors. These are connected to square steel deadbolt bars, for positive door latching. 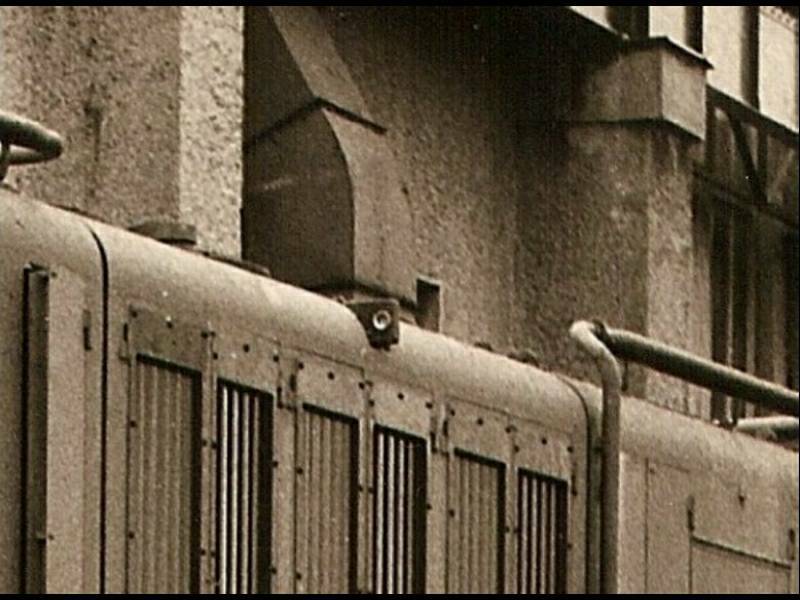 If a door was open on a moving K-M, you can be sure it was because an engineman wanted to get more air to radiators or intakes, and not because the door latch had a mind of its own! 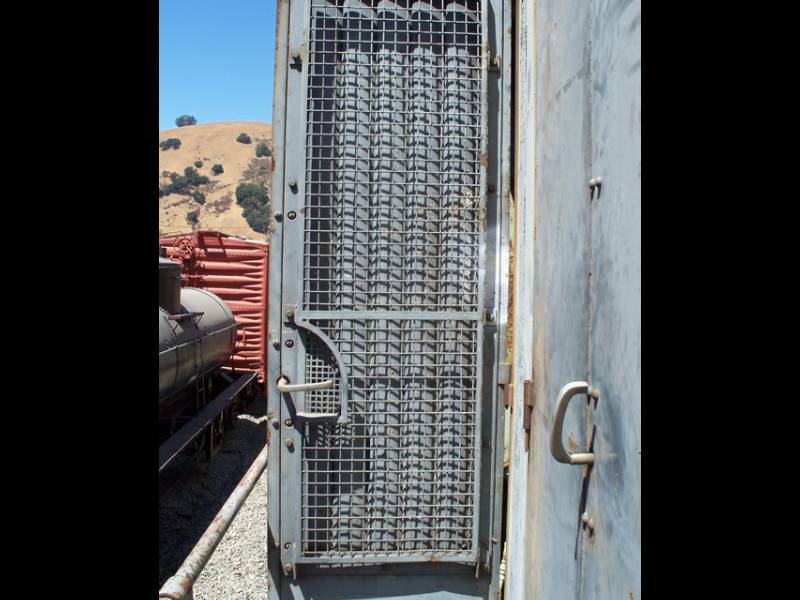 Several units were "upgraded" with permanent latch handles on five exterior access panels for cab control equipment. 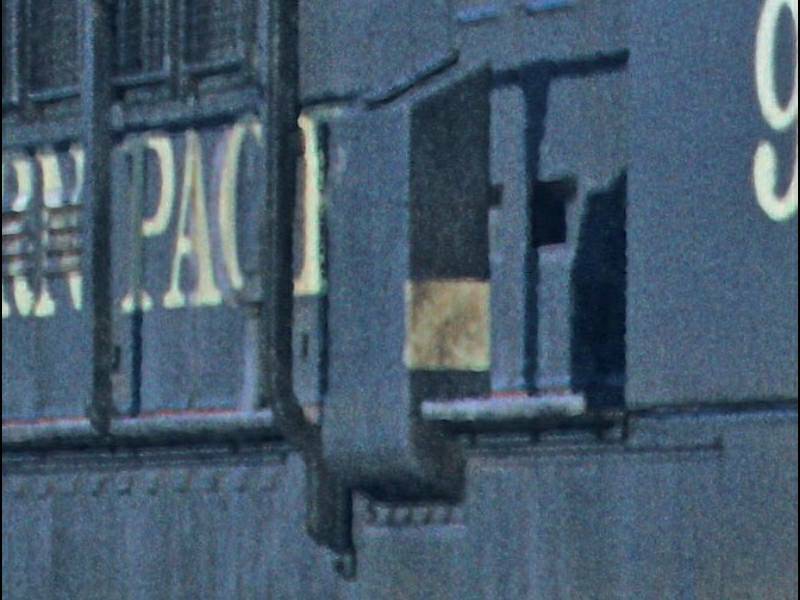 Photos confirm this on SP 9011, 9112 and 9013/9016. 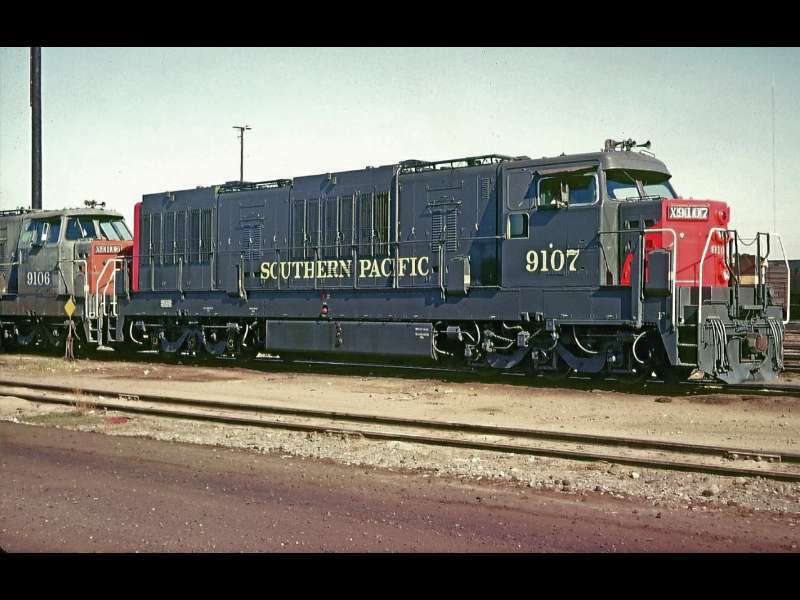 SP 9106 and 9120 received just three, on the cab sides -- but not on the front-facing doors. 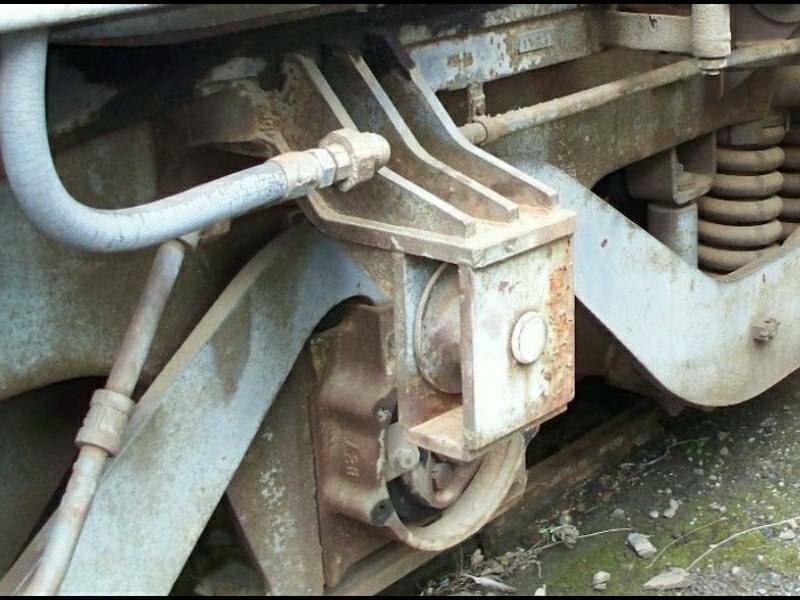 The source for these extra handles is under investigation, since they appeared before any of the units had been consigned to scrap. Finally, it appears that 9116's sun visor was fabricated in one piece (no center joint) and is deeper than the others. 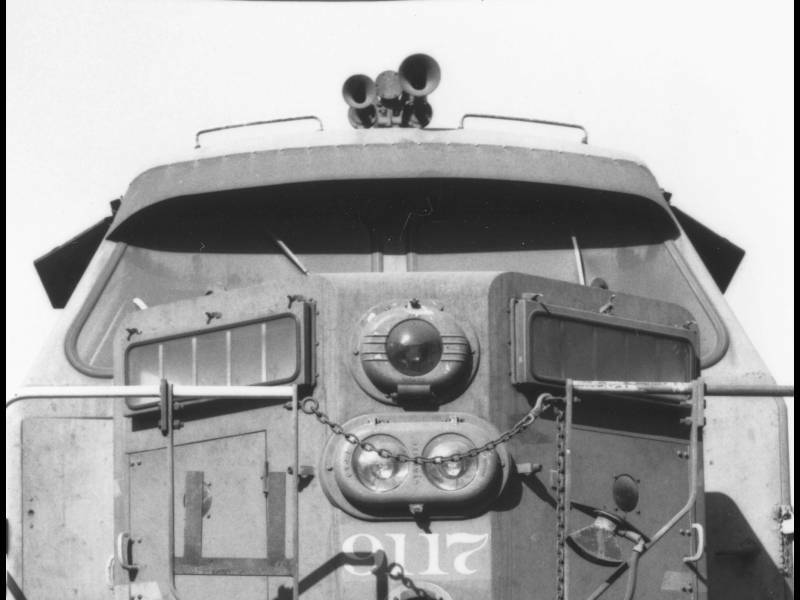 In the eyes of many railfans, the beetle-browed sun visors, short windows, and squared radiator tanks of the ‘Final Four’ became the iconic image of a K-M hood unit. 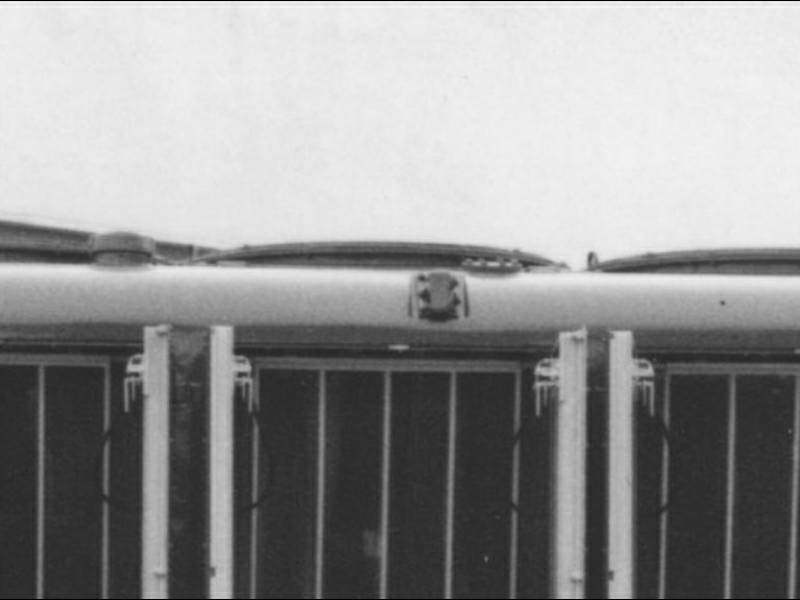 But in fact, the square tanks were applied to a mere four units – 9107, 9113, 9116, and 9120. 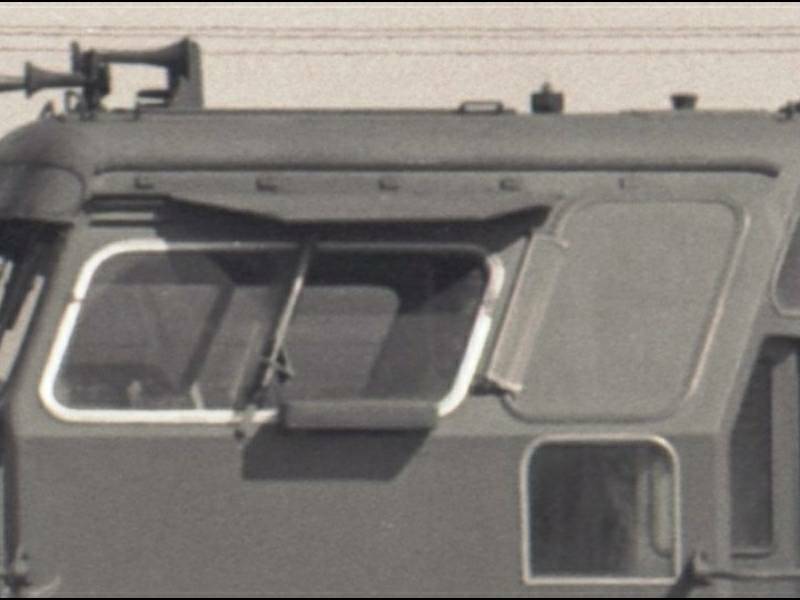 And though the visors and short windows were an inseparable part of that iconic appearance, the window modifications and the squared tanks evolved separately and had no specific relationship, one to the other. For the fifteen hood units, a life of changes ended with the major rebuilding of only four of them. Why perform an extensive overhaul on so few? 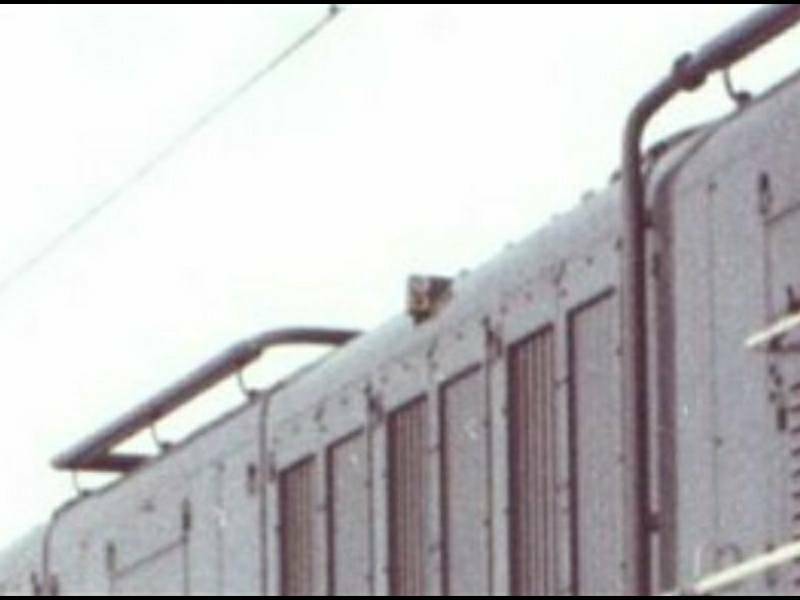 Perhaps it was a test program and all units would have been eventually fitted in kind, had not the plug been pulled on the entire K-M program two short years later. Or perhaps those four held the best records for serviceability of the fleet, or showed the highest mileage and were the most in need. 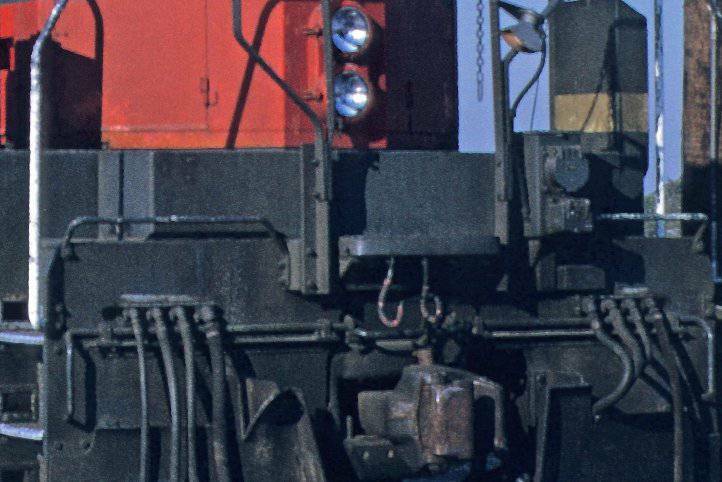 Here, a freshly-rebuilt SP 9107 shoves on the drawbar of sister SP 9120, outshopped from the R7 program four months earlier and already showing a little fade to its gray flanks. SP 137 dynamometor car is trailed by a prewar all-room Pullman Standard sleeping car for the road test crew. 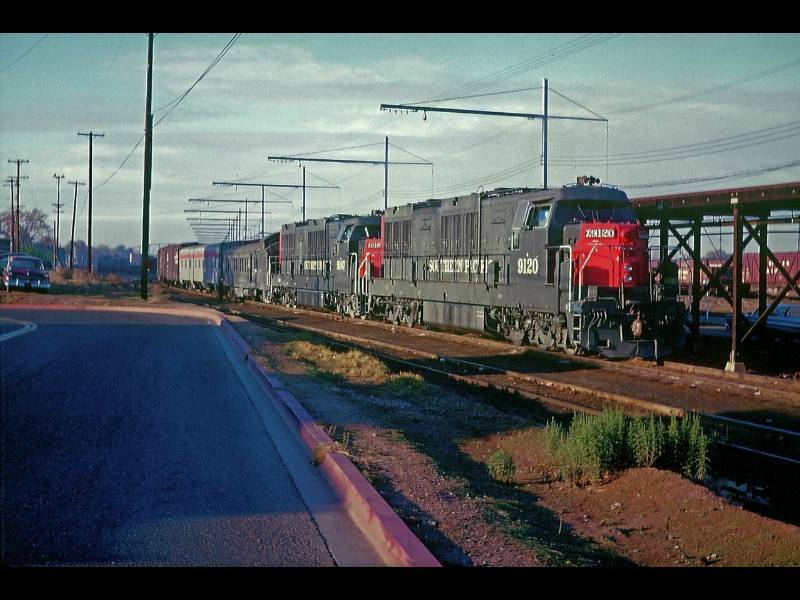 The humpbacked ‘Final Four’ were not alone as the last K-M hood units to be retired from locomotive duty. 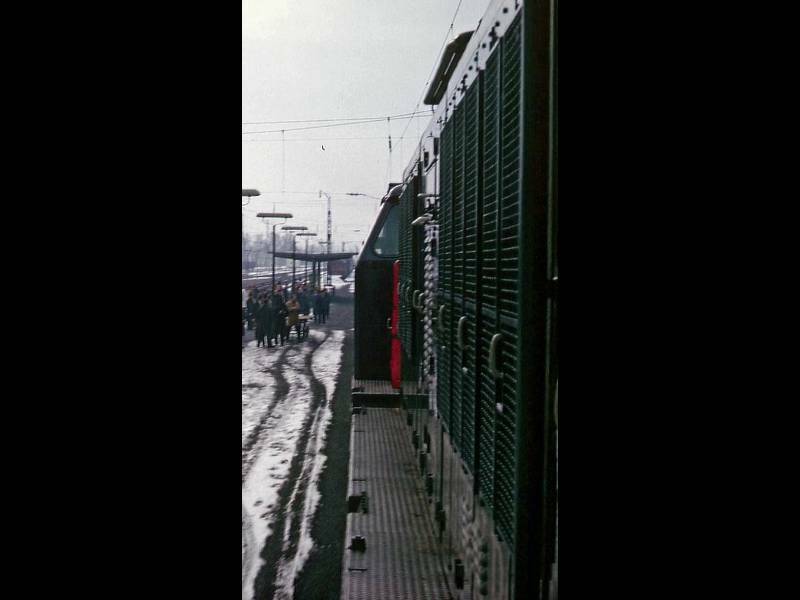 But only three other units – 9108, 9110, and 9118 -- survived with them to the final K-M ‘vacate’ date of November 22, 1968. 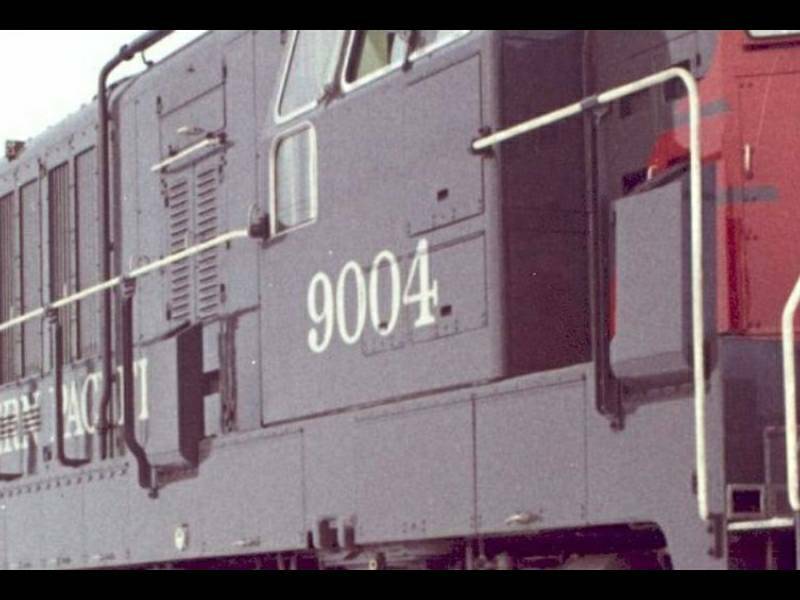 For the most-modified K-M hood, the honors have to go by default to the PLA's own SP 9010, because of its Camera Car conversion on the heels of the highly-visible mods of the R7 rebuild. And the least-modified? Here's a surprise: for whatever reasons -- to maintain a "control example" as chosen by the SP Mechanical folk, or just by the luck of the draw -- SP 9118 ran out its life with only a few notable modifications. And those were barely visible: the raised MU box, the built-in "spot" platform lights, and the reflective tape on the sandboxes. 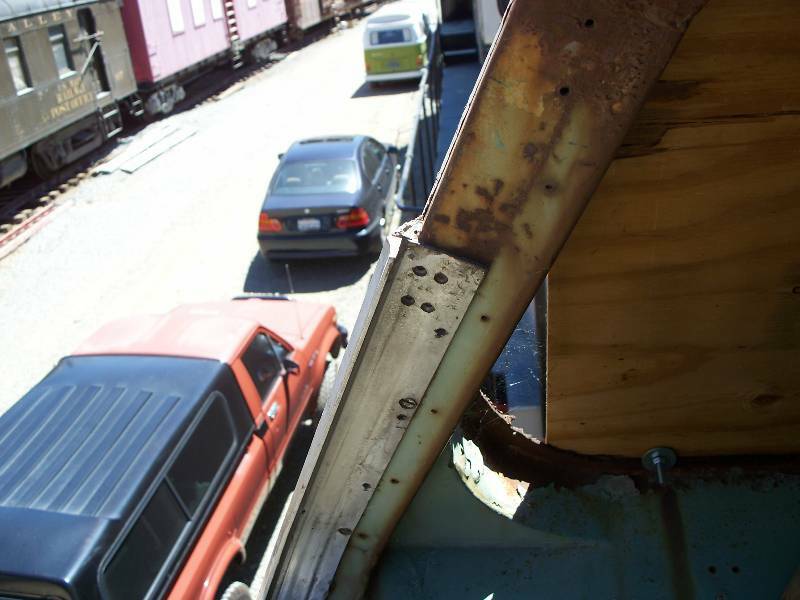 Possibly a painted-out upper-rear cabside window. And of course, a renumbering from SP 9015. But no visor or lowered cab windows. No extra ballast. No additional heat exchangers, no M5 horn. It kept its straight-from-the-factory looks for its entire obscure life. And perhaps the oddest of all, it was part of the final set of "retirees", not stricken from the roster until late 1968, side by side with the R7 final four. 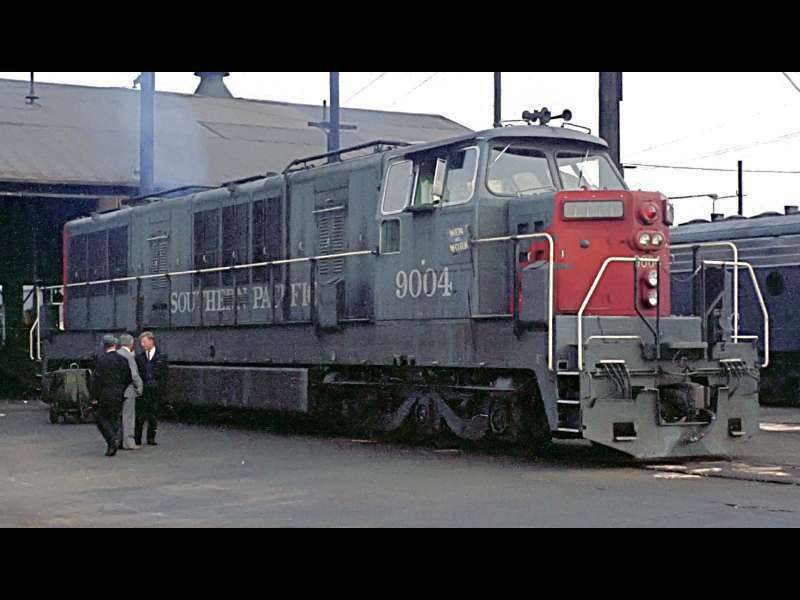 Of the ‘Humpies’, SP 9120 was the only unit ever offered up with confidence by the SP for a passenger excursion, sponsored by our own Pacific Locomotive Association on April 30, 1967, operating from Oakland to Tracy and return... through Niles! For the fifteen Krauss-Maffei ML4000C’C’ hood units, at that moment, a “life of changes” was officially over. As we’ve explored in this survey, the final R7 overhaul resulted in some of the most memorable visual changes to SP 9113, even if those changes were not unique. 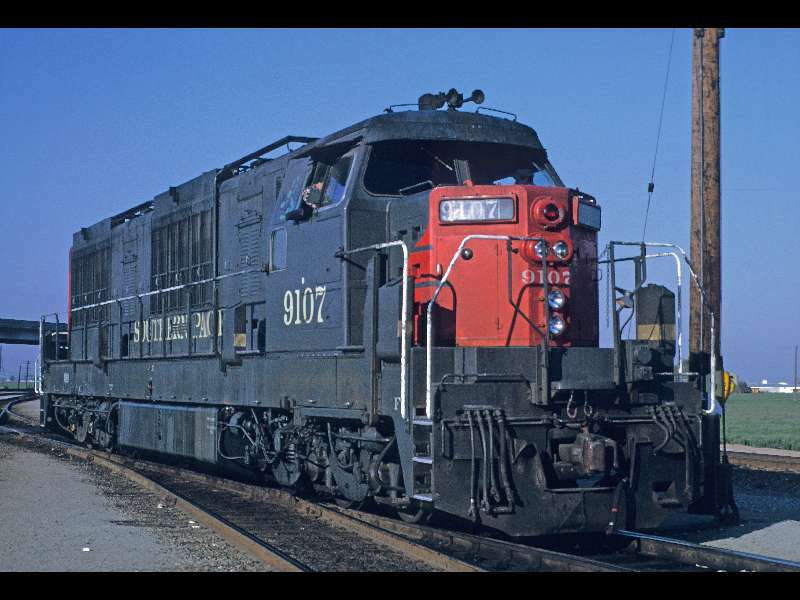 Nor would that upgrade turn out to be the last major alteration for the locomotive built as SP 9010 -- its conversion to SP 8799 Camera Car would result in the most dramatic visual changes of all.